Shara is currently traveling off the grid, with no internet access. 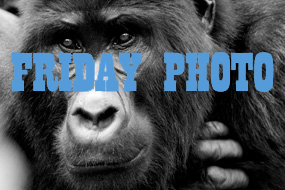 Friday Photos and feature articles will resume in late May. Check back soon! 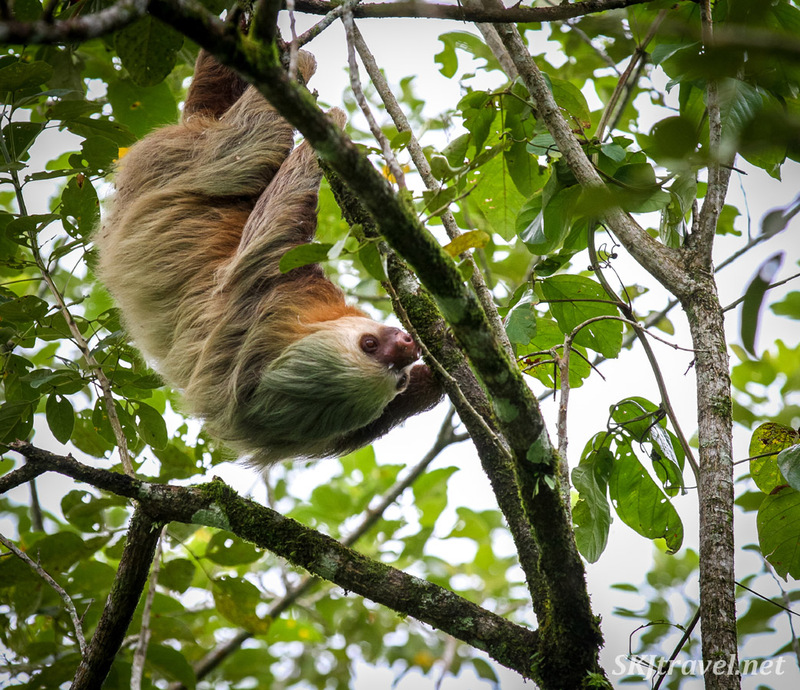 Most recent feature entry: "Costa Rica Sampler: Beach, Rainforest and Sloths!" 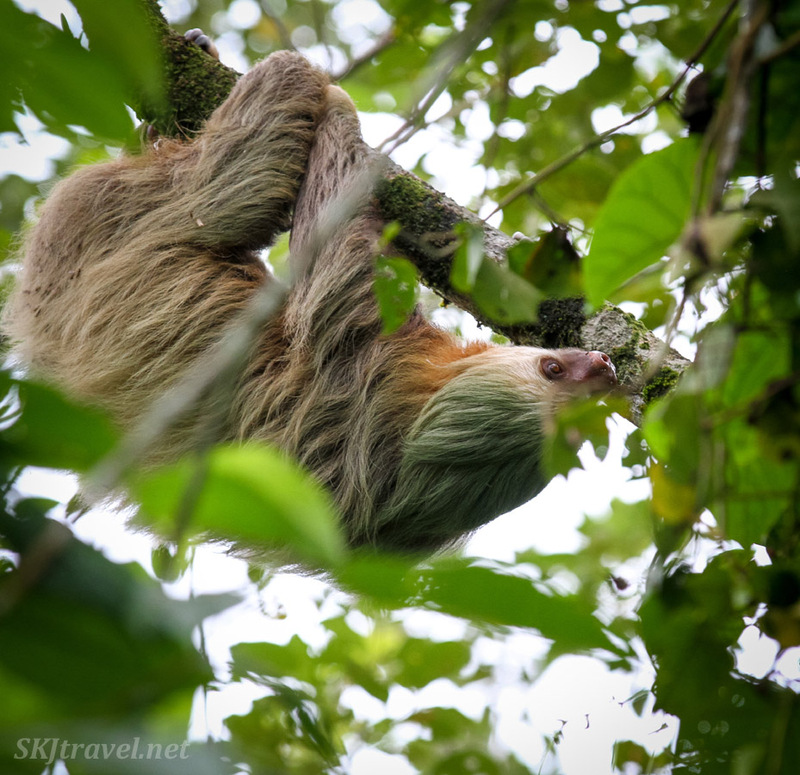 Costa Rica Sampler: Beach, Rainforest and Sloths! 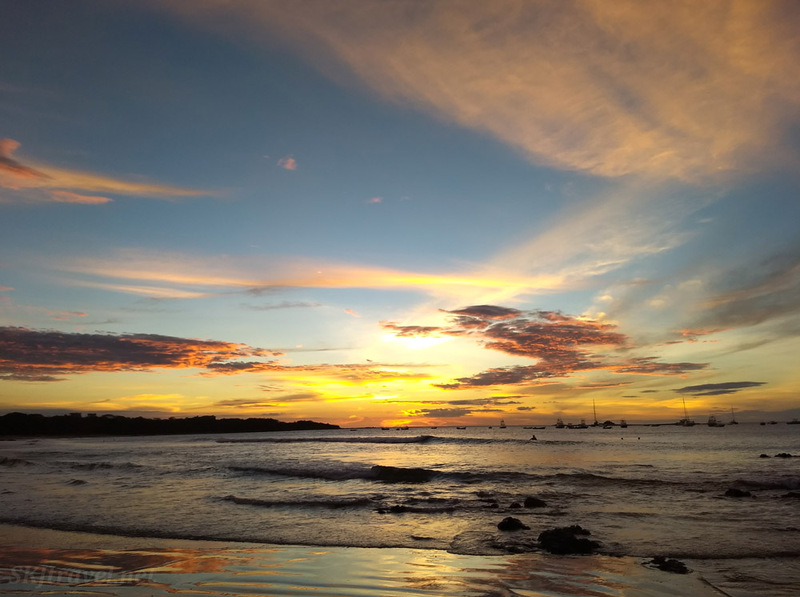 Mid-November in Tamarindo, Costa Rica, was lovely. 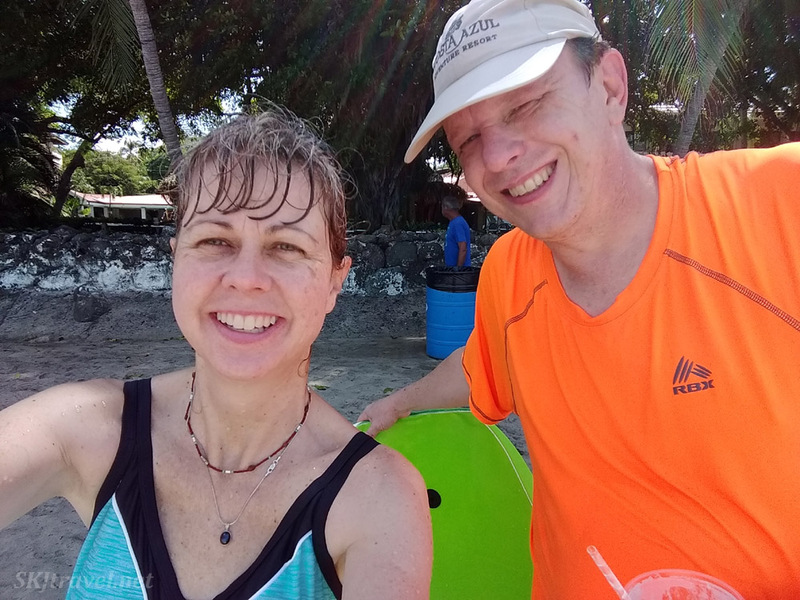 I was bracing for brutal heat and humidity, being an equatorial climate, but the beach at Tamarindo provides a nice breeze most of the time that brings the comfort level for this high-altitude Colorado mountain girl into the tolerable range. Evenings were perfect, watching the sunsets each night on the beach. I'm not typically one for a beach vacation since I don't sunbathe or surf. But I ended up spending hours and hours boogie-boarding in the splendidly perfect boogie-able waves. Really, it's the most fun I've ever had boogie-boarding, which I hadn't done since I was a kid. This is the first time I ever took a cell phone with me traveling. I gave in. I couldn't help it. A selfie at the beach. And one of the neatest discoveries was the erosional artwork the tide made in the sand each morning ... see the pics at Shara Sees Artful Sand and Seashells at the Seashore. 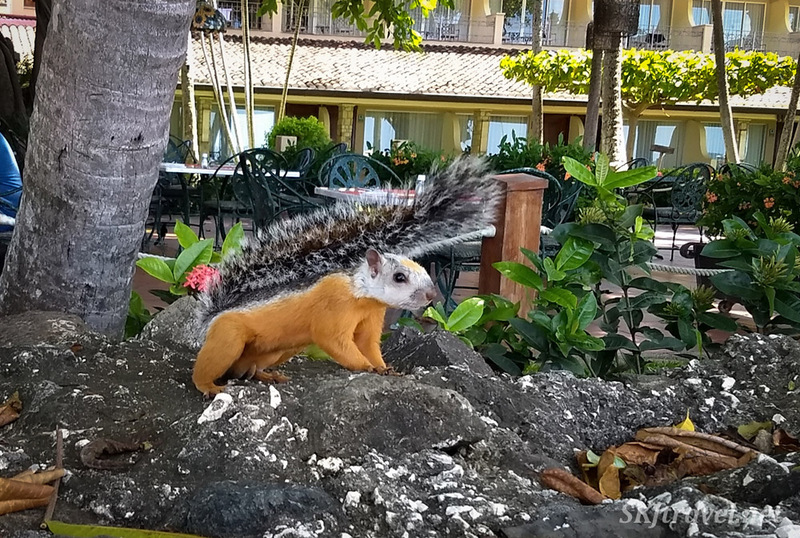 These utterly adorable variegated squirrels darted around the beach-side patios and bars looking for yummy tourist tidbits. 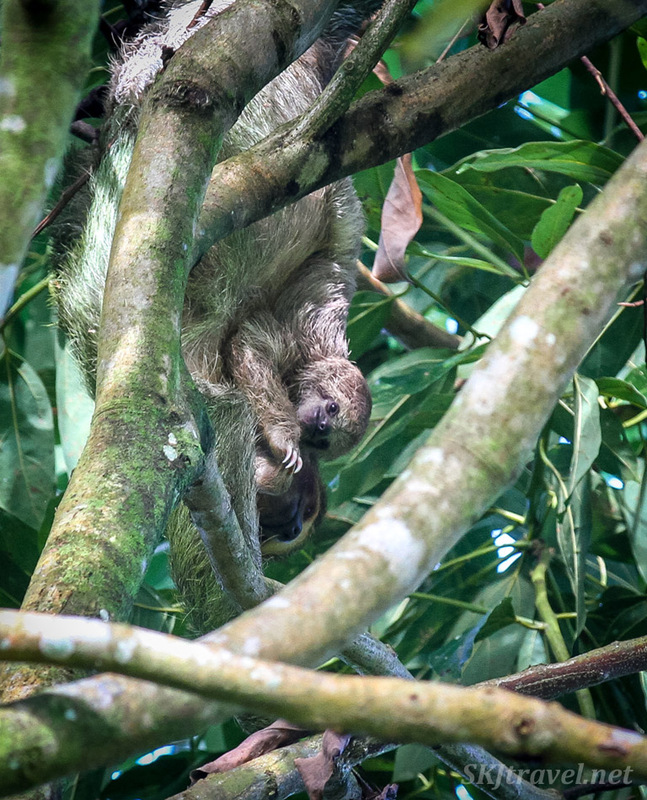 When I learned my family had chosen Costa Rica for family vacation, the first thing I thought of and determined to do was find sloths! 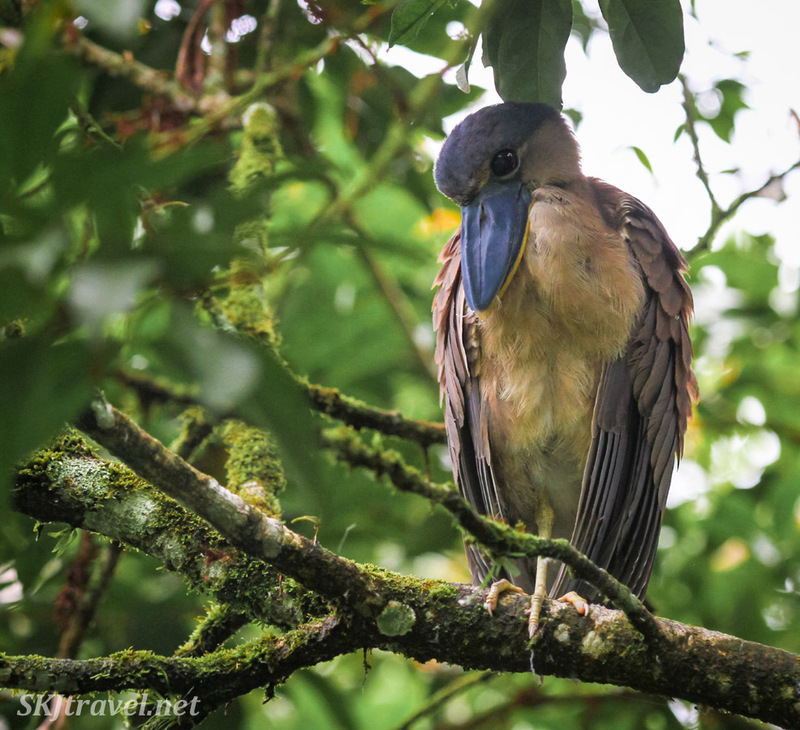 It turned out we needed to travel quite far inland into the rainforest region to see them. 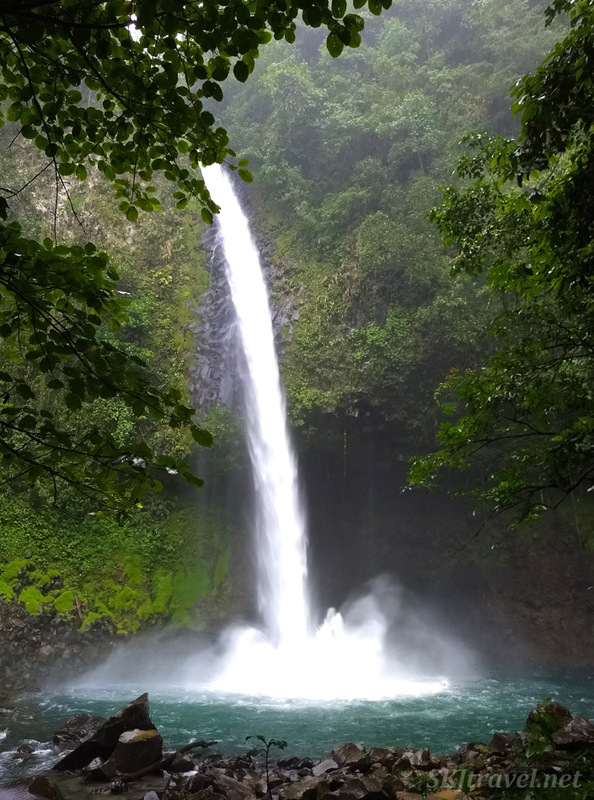 So Erik and I took a shuttle van to La Fortuna and spent the night. 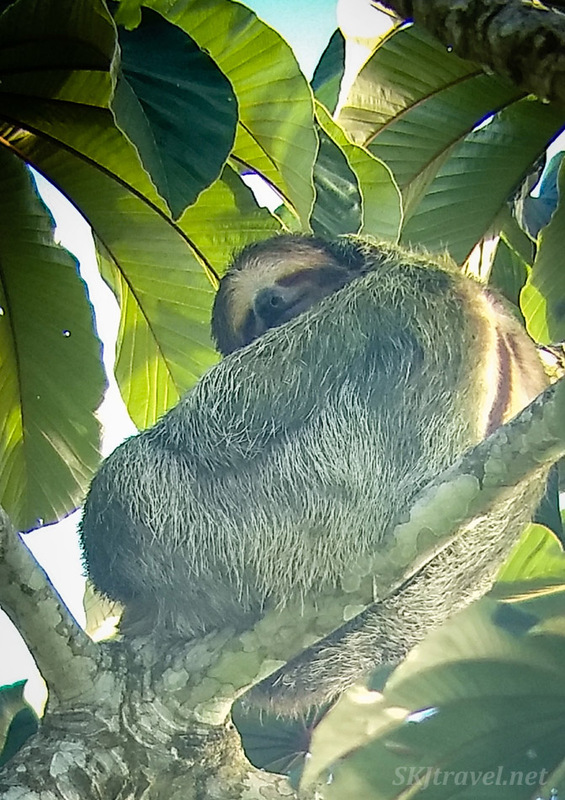 You can see some of the other beautiful animals we saw there in my post, A Glimpse of Costa Rica, but here I present to you sloths! 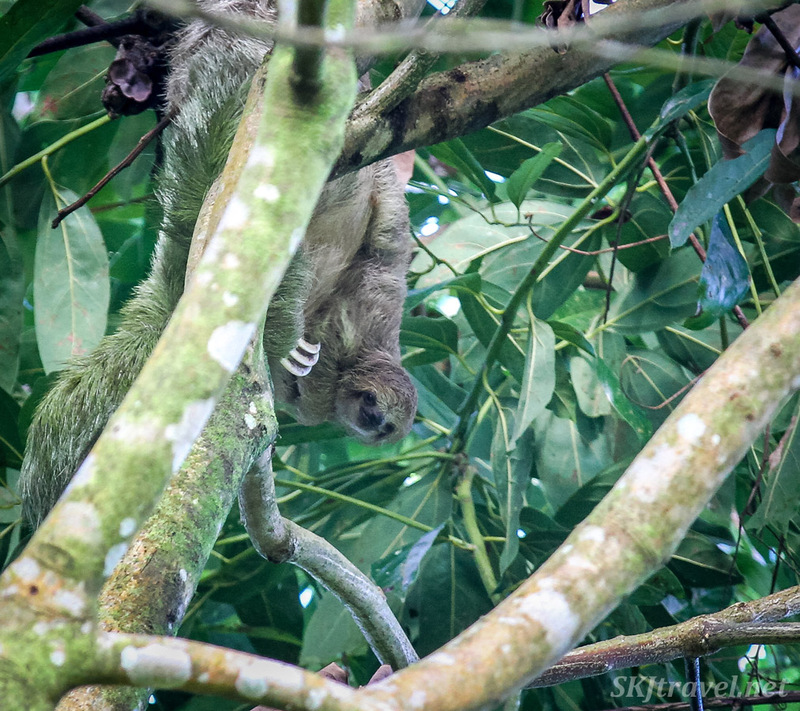 I can't write "sloths" without an accompanying exclamation point because when I say the word in my head, it sounds exclamatory, as I was so excited to see them. 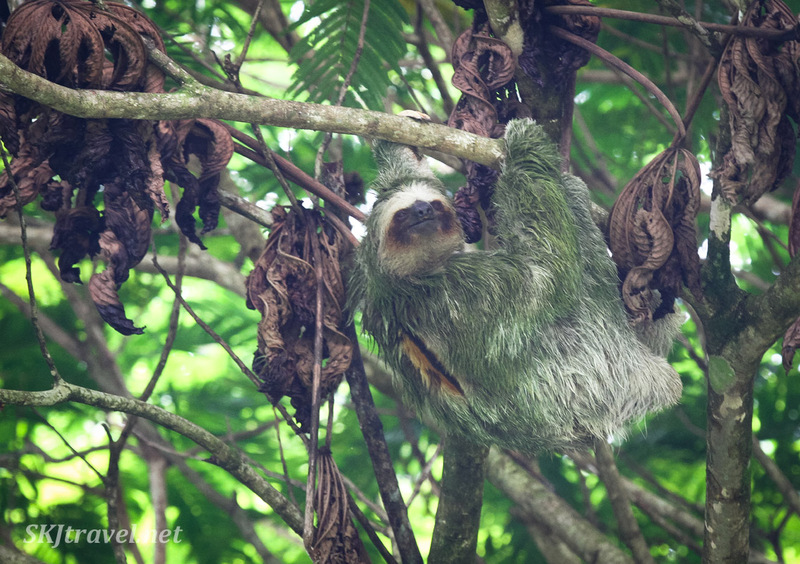 We saw this two-toed sloth in the trees along the Bogarin Trail. He was very close. I had made jokes with friends beforehand about hoping to get some pictures of sloths! but being worried I might not have a fast enough shutter speed to capture them racing through the forest. That seemed like a ludicrous scenario, but funny enough, this guy was moving astonishingly quickly through the trees, and as the light was dim and I was trying to find a good ISO and aperture to capture him with, I almost missed him! Erik said, "He's racing away!" 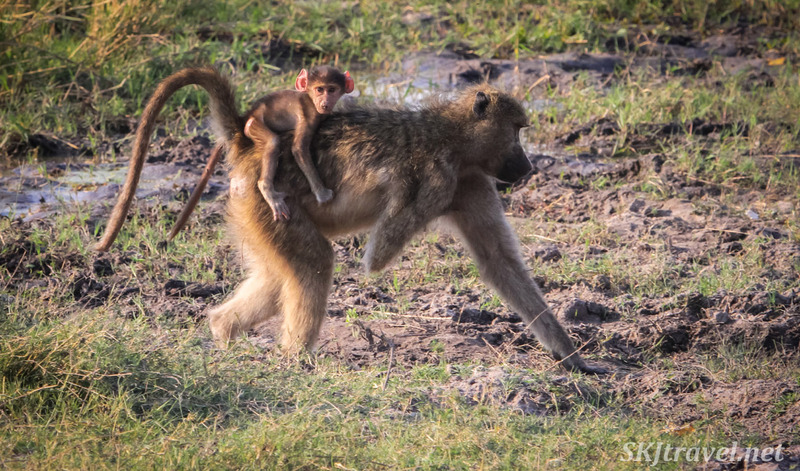 You may have learned from previous African safari adventures that I lose my little mind for a minute when I'm super excited over a particular animal sighting. Takes me a minute to get my camera wits about me. This three-toed male sloth was more obliging and sat nice and still (in the even dimmer light). Doesn't he look happy? I think he's smiling at me. As we left the park, we spotted this rodent critter poking around the bushes. 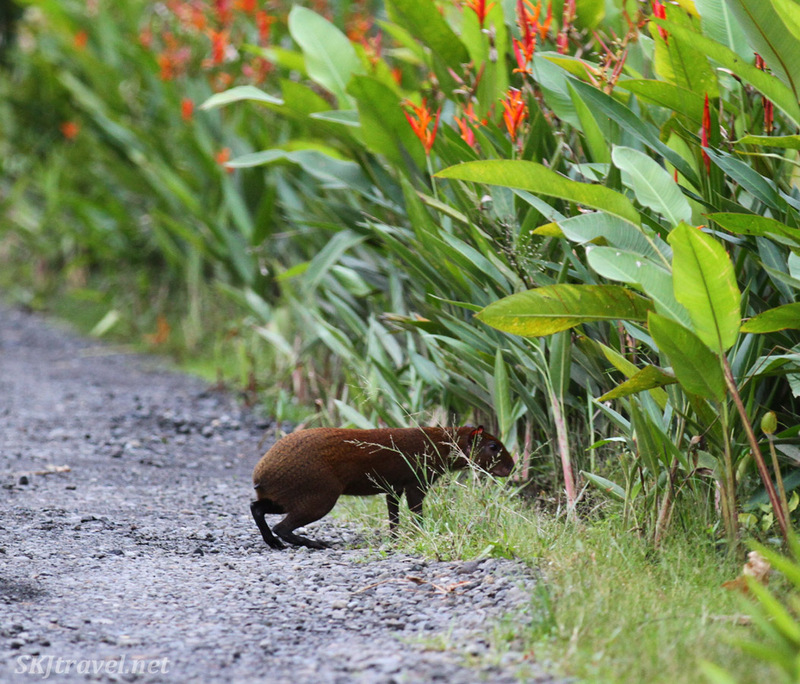 We had to ask the staff what it was: an agouti: rodent found in Central and South American rainforests. On our way back from the park, we stopped off at La Fortuna pub when we saw it was a microbrewery. I was delighted to find they had a chili beer on tap. I love a well-integrated chili beer. Being beer enthusiasts, we struck up a conversation with the proprietor ... kind of accidentally because I jokingly asked him when he was tapping the next keg in his garage. He said, "next weekend," and looked at me like, "how do we know each other?" I laughed and said I was just kidding, but that sparked off extensive conversation, numerous beers, and before we left, he had brought out some special home-brew in bottles he kept in the back and only served to friends. So presumably, we are now friends. 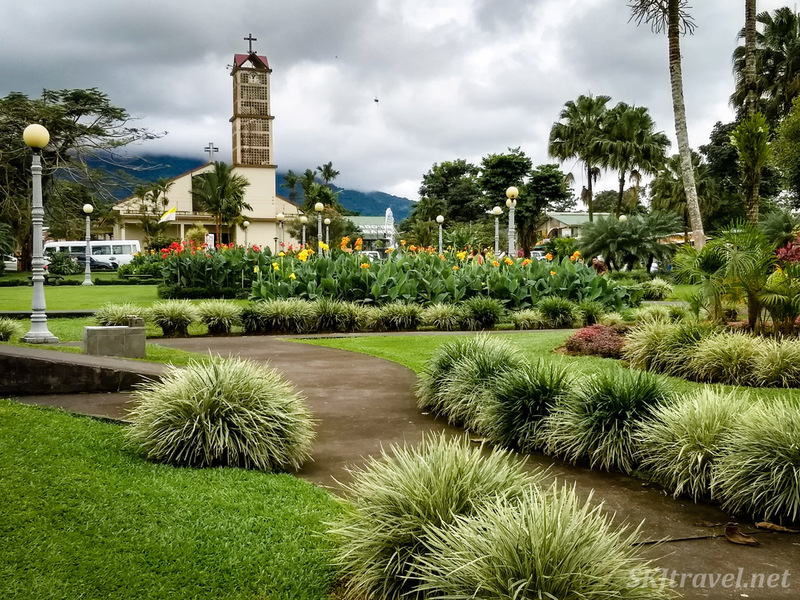 La Fortuna is a pleasant town, with a small downtown area, a few blocks square with plenty of restaurants and cafes and a park. At night while we ate dinner at an open-air restaurant, we watched a little dog run around the deserted streets in a Santa Claus sweater. Random. 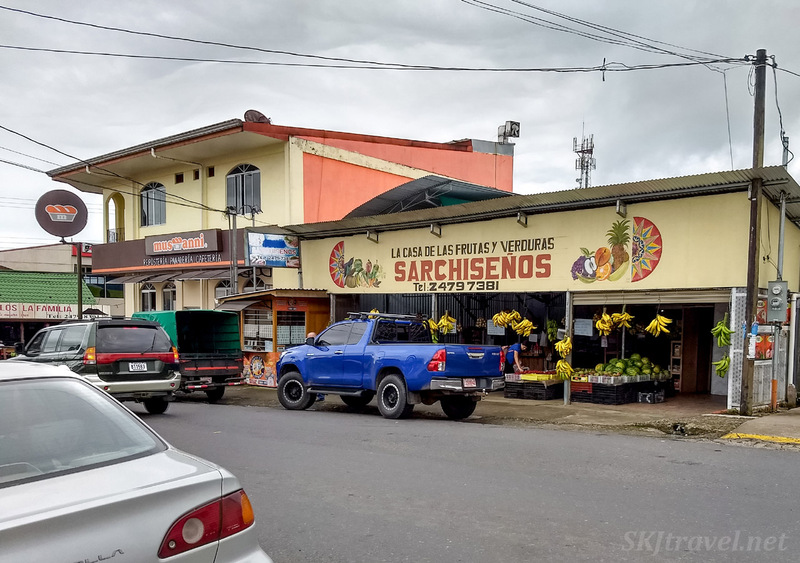 It feels like a real Costa Rican town, unlike Tamarindo that feels just like a tourist town. Everywhere is green fecundity and flowers. 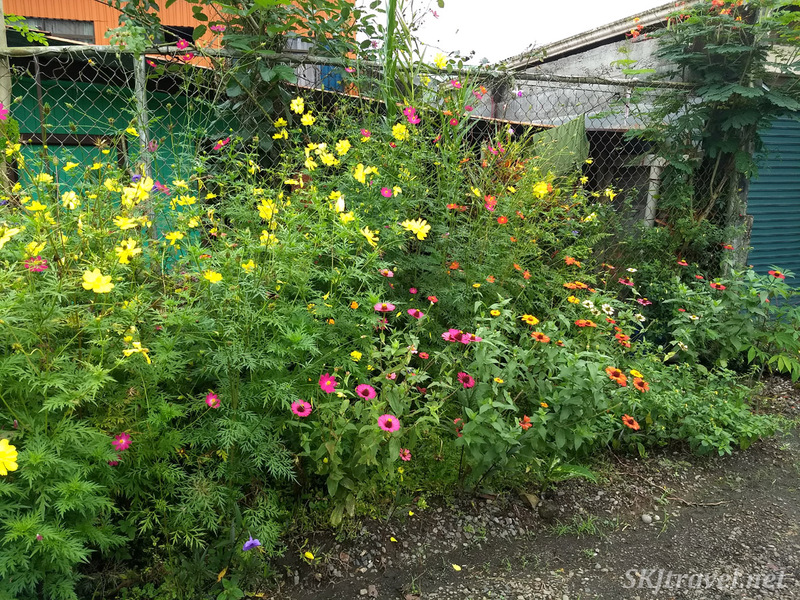 This is a yard near our digs, Hotel Secreto. I thought it was a nice hotel for budget accommodations. Although I was completely satisfied with our sloth sightings on the Bogarin Trail, we had signed up for another tour in the morning through Callidryas Tours. We hit what I would consider a jackpot on this early morning tour. 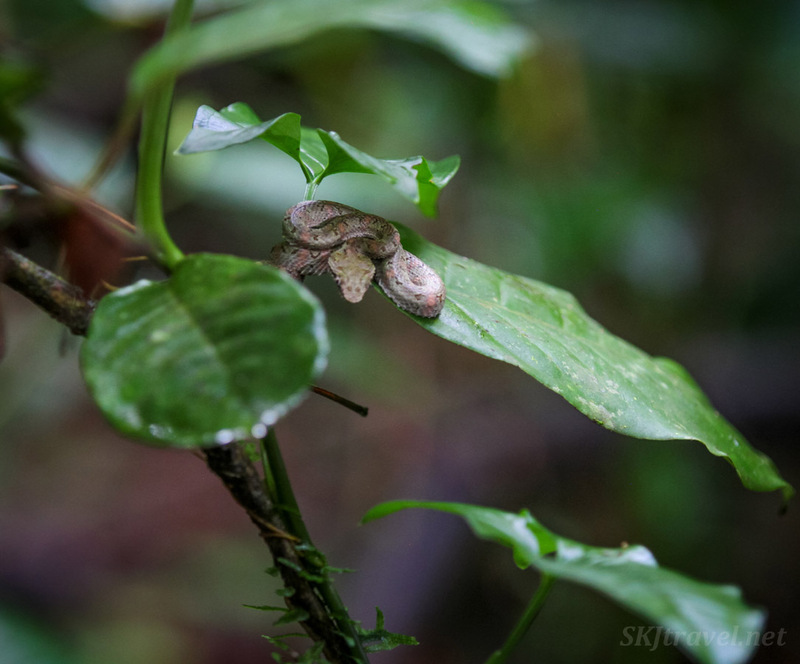 In total, I think we spotted 15 sloths! Driving in the van on the way to the place our guide, Gerald, and his spotter had selected to look for them, he asked us -- there were three other people on the tour with us -- what we knew about sloths!. After a brief period of silence, I volunteered that they move so slowly that algae grows on their fur. "Yes!" Gerald said, sounding slightly surprised and surely pleased with my impressive knowledge (ha), which I gleaned from guess where ... a True Facts episode about them. I don't think it's *because* they move slowly that the algae grows, but I imagine a slow-moving creature enhances its growth capabilities. 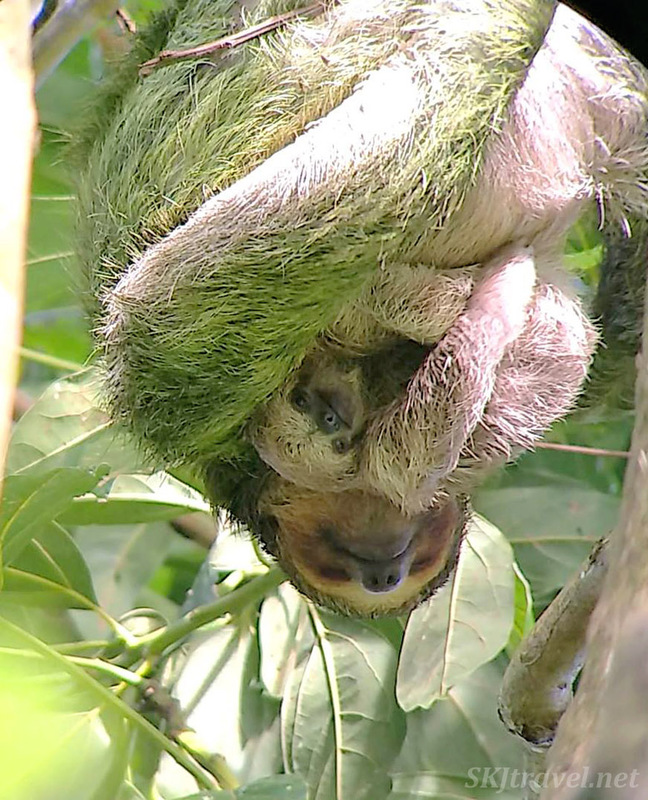 So yes, sloth fur often looks green because of the algae growing on it. I'm kind of figuring sloths! don't smell all that great. But I haven't been close enough to one to know. Another interesting thing about them is their weight. 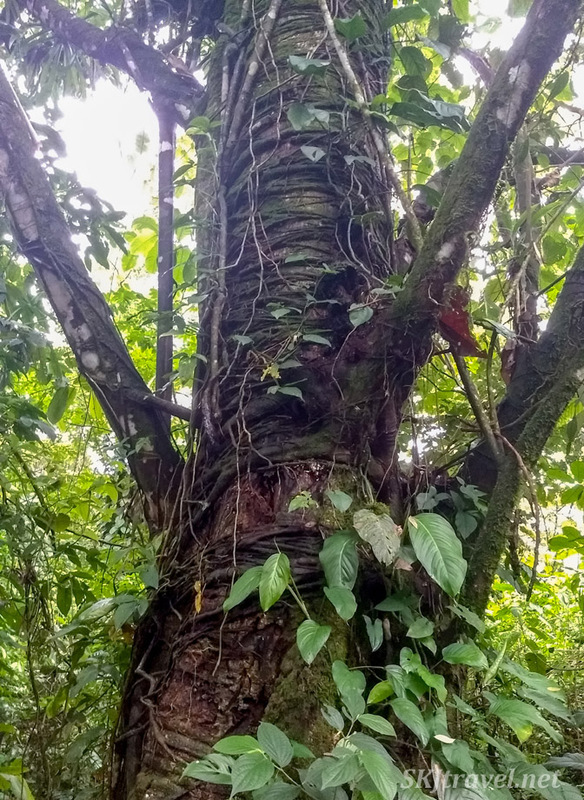 I made a comment while looking at one with Gerald that I was surprised such a small limb on a tree could support the sloth we were looking at. He said, "How much do you think they weigh? Whatever you think, I bet it's not anywhere close." Given this clue, I guessed what I thought was a ridiculously low number (and lower than anyone else in the group guessed). I guessed 12 pounds because that's how much most of my cats weigh (excluding the legendary Mister). Nope! Can you guess?? The three-toed sloths! we were looking at, he said weighed about 9 pounds. That's because they have hollow bones like birds do. So this male weighs less than my cats. How do I know it's a male? Because of that brown stripe on his back. Fortunately the highlight of our sloth viewing experience involved a non-racing sloth. It was early in the morning and after the spotter pointed up to this particular one, he set up a tripod with a monocular on it. Is that a word? I don't know. But instead of binoculars, it just had one eye-piece like a telescope does. And what did he notice after looking through it?? I was not the only one who squealed with excitement when he announced it was a female with a baby. Practically jumping up and down, I waited my turn to see the baby and could just make out its little face nestled against mom as they hung upside down in the tree. Then with a choir of angels sounding in the background, a ray of sunshine found its way through the thick cover of leaves directly onto the baby and mom. That pic was taken with my cell phone camera help up to the monocular thingy. Gerald said that, kind of like reptiles, the warmth of the sun encourages the sloths! to move from their otherwise predominantly stationary positions. The baby emerged and began scratching its chin and then its mom's chin. I really can't think of another situation in which people are beside themselves with joy over an animal simply scratching themselves. But these are sloths! Any movement is terribly exciting. There was a couple on their honeymoon on the tour and they were just as giddy as I was. So. 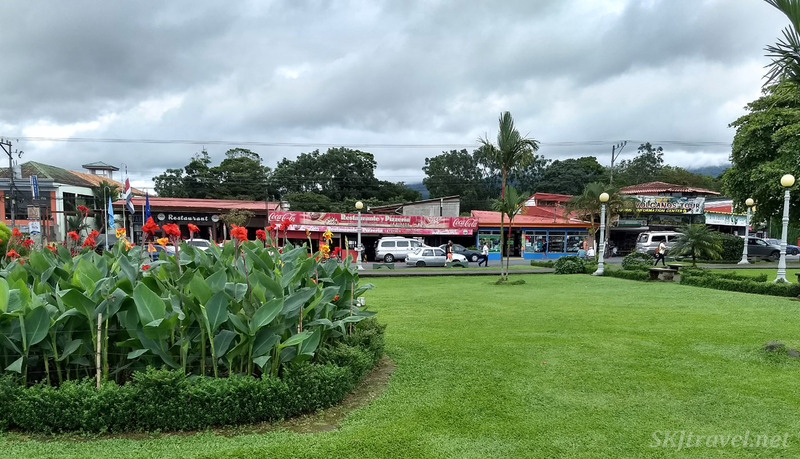 With mission accomplished in La Fortuna, we decided to spend the afternoon until our shuttle van departure back to Tamarindo at the La Fortuna Waterfall. I had read reviews of it on Trip Advisor, and most of them mentioned thick throngs of tourists, almost unbearable to some reviewers. It was so close to town that I decided to go anyway because of the convenience and I love waterfalls. I just steeled myself for the crowds, at least I knew to expect them. But I don't know if we were there on an anomalous day or if the reviewers were hyper-sensitive to other people being around, but we found it sparsely populated, had all the viewpoints to ourselves, and enjoyed a nice lunch in the cafe before heading "home." I mentioned the butterfly garden, palace to a lone butterfly, in the previous post. 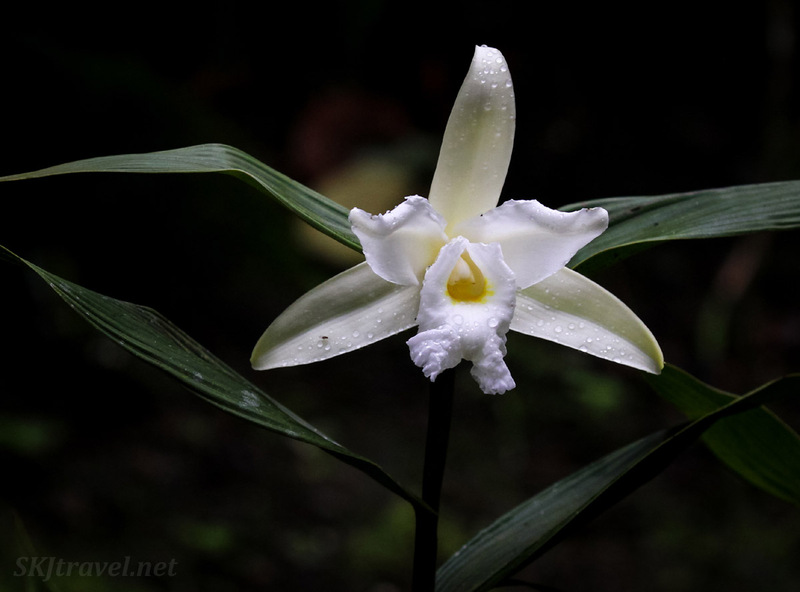 There was also an orchid trail. I was very excited about this. 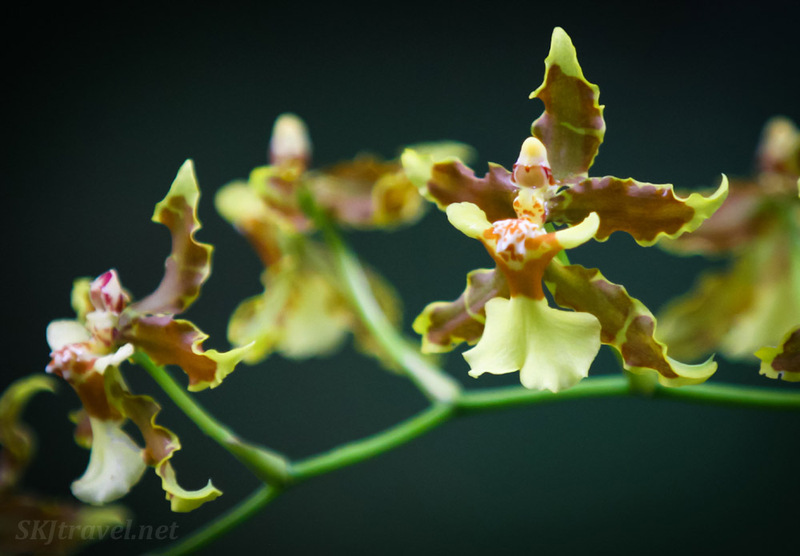 I love orchids and am always trying to grow them at home, with mixed success. 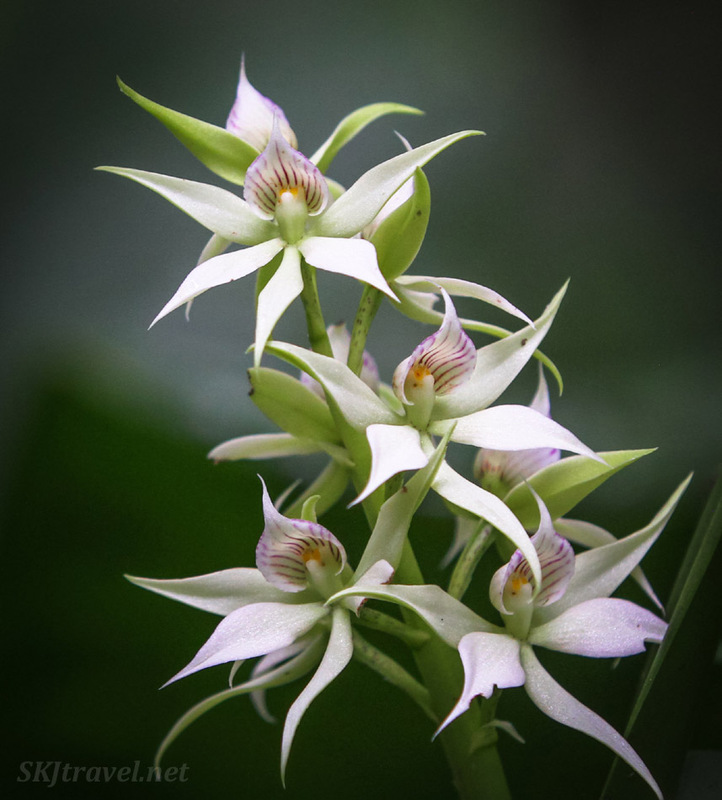 Shortly before leaving for this trip I learned from a David Attenborough show that the type of flower that has the most species on earth is the orchid! Who knew? I always thought they were relatively rare and exotic plants. Turns out they're profuse, and after walking through this garden, we got a feel for how widely they differ in size and shape. 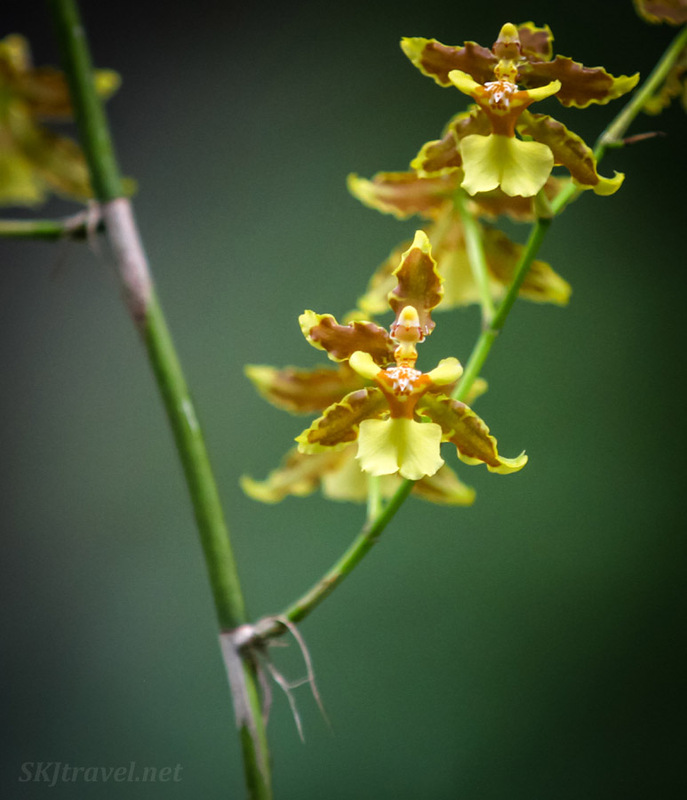 But, like the butterfly garden, only a few of the orchids were actually currently blooming. We saw the others from the pictures on the tags next to where each one grows. Here are a few of the ones we saw in bloom. The first ones look to me just like little people ... like a man and woman dancing together, man in pants behind the woman in a dress, in some kind of traditional costume. Erik and I cracked up over this sign in the garden because the human figure looks totally evil with her slanted eyes and frowny mouth. 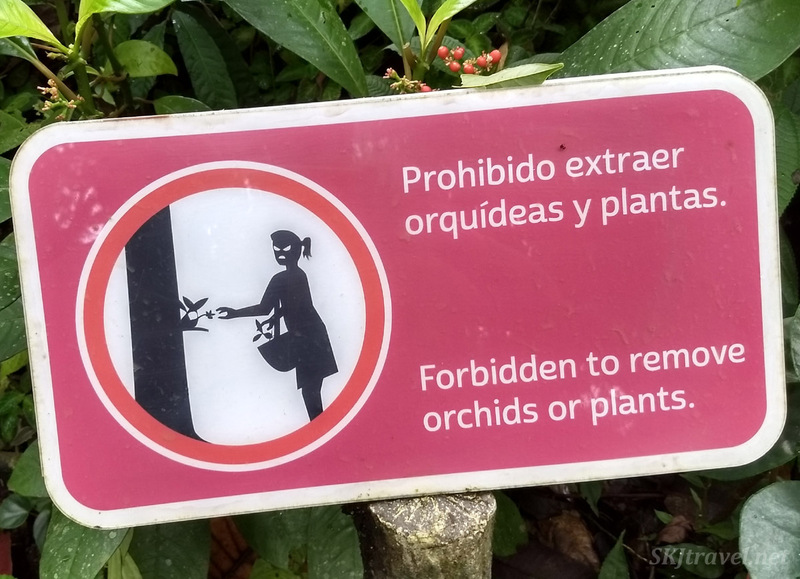 Why do they presume it's girls who will pick the orchids?? 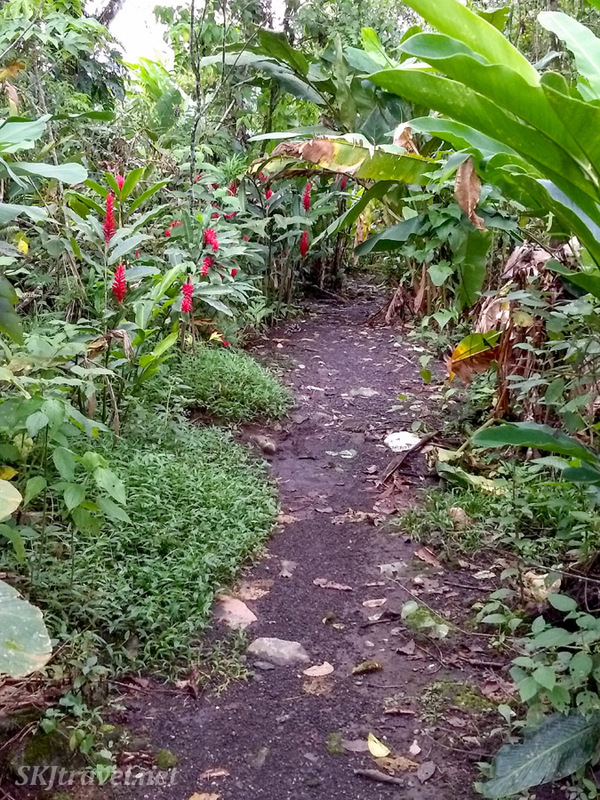 This path through the garden was blocked off and was already being digested by the jungle. It reminded us of when we were in Tikal in Guatemala, a guide told us that they have to "shave" the ruins regularly to keep them from being digested like this. It's why it's so difficult to locate cultural remains of Central American civilizations! 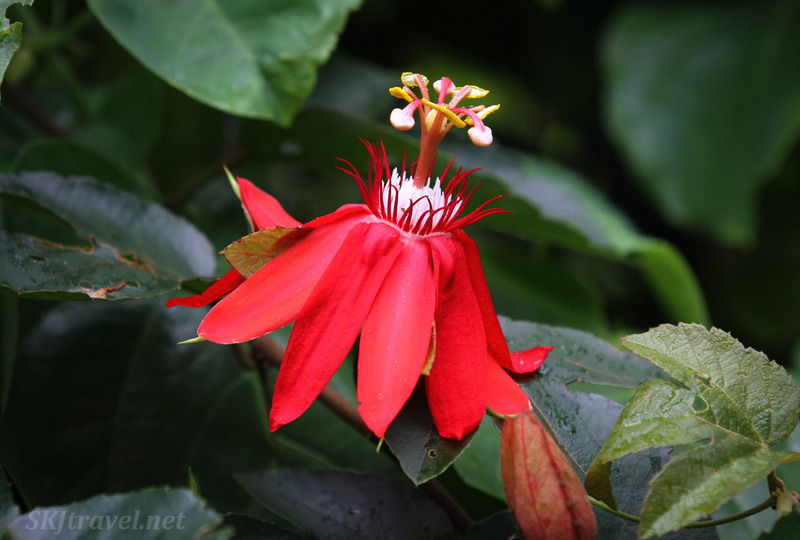 A pretty non-orchid flower. I don't know the name of it. 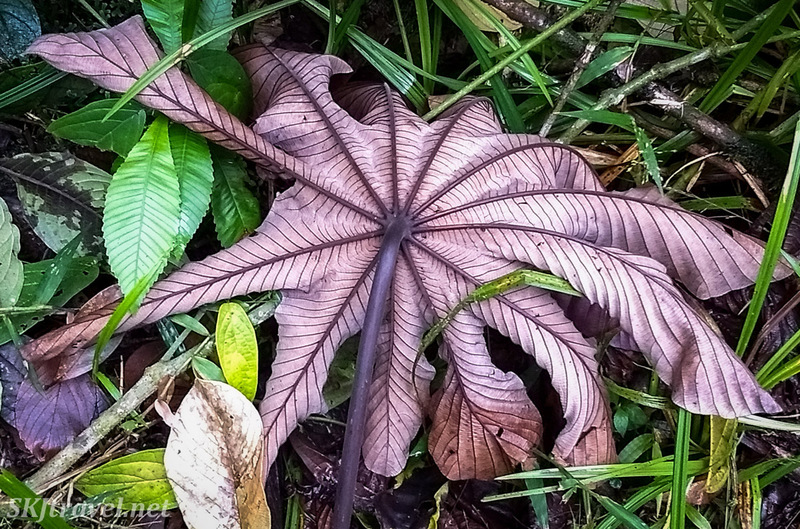 The textures in the rainforest are so captivating. I learned the word "fecundity" from Annie Dillard in her book, "Pilgrim at Tinker Creek." It's a good word. 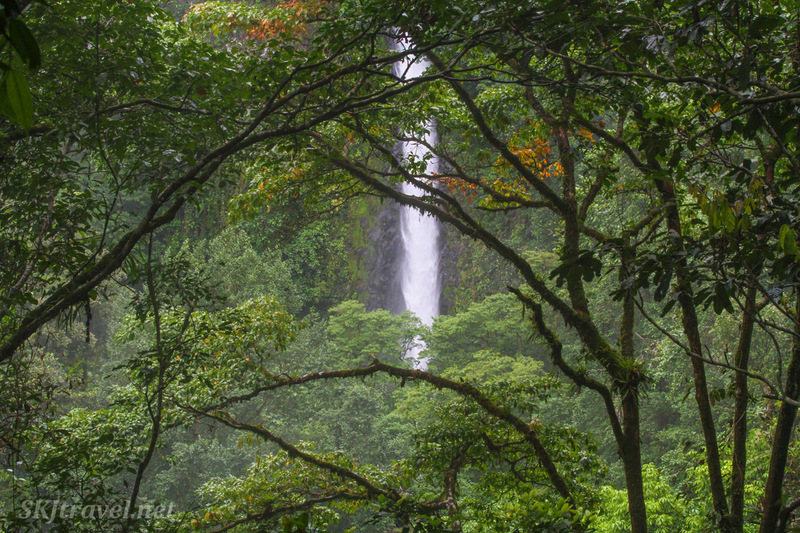 I thought of it a lot, almost continually, walking through these dense rainforests around La Fortuna. That, and "diversity." The rest of the time I was either squealing over critters or admiring with an almost empty mind the colors and textures that Mother Nature wields every single moment of every single day in every corner of the planet. 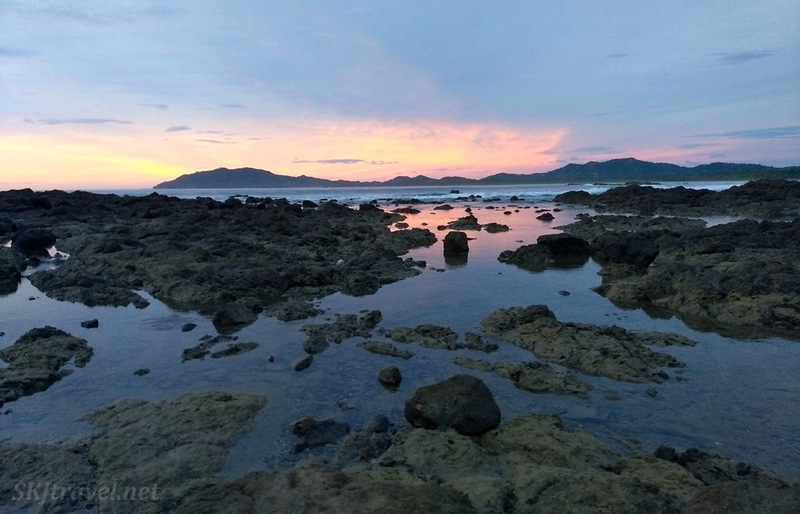 Besides sloth-seeking and boogie-boarding, we did a few other activities in Tamarindo. One was kayaking through a mangrove swamp with interesting flora and a troupe of howler monkeys. Another was going out with a guide to try to find nesting turtles on the beach. We saw one, it wasn't a leatherback, but it was very, very large! We watched her digging a nest, and in the end she didn't lay any eggs but retreated to the ocean, dissatisfied with that nest. 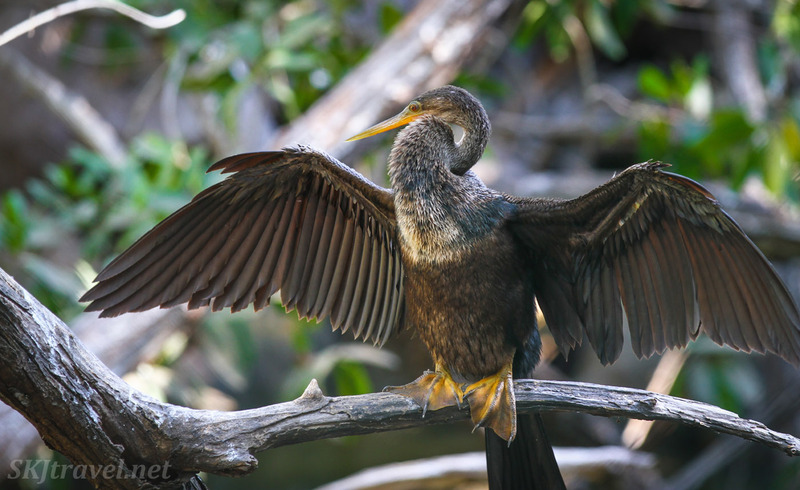 The guide said that from the time the female forms the eggs inside her, they can stay there for three to four days, so she has several days to perfect her nest. 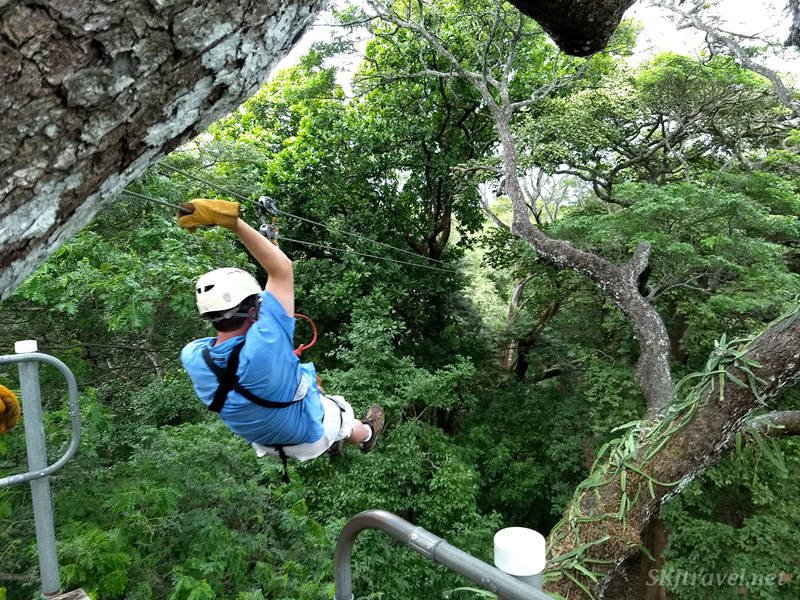 The other activity was ziplining. From what I gather, this is perhaps the number one activity advertised throughout Costa Rica. It was fun. Erik and I had done it before many years earlier in Guatemala when the activity first came onto the scene, and it was much more low-budget. 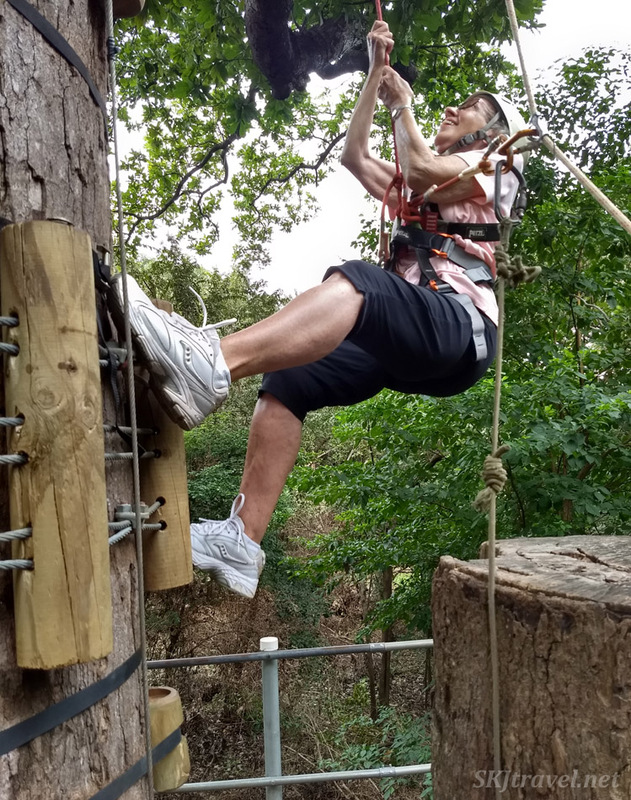 This place had very good equipment (as evaluated by my brother, a world-class rock climber) and was very professional, helping my 82-year old mom handle the course with ease. Hi mom! She might not like me sharing her age, but the guides exclaimed that by far she was the oldest client they'd ever had. Mainly I bring that up to say that it is a fun activity that, while perhaps not exactly adrenaline-pumping for the more adventurous, can be enjoyed by anybody. There were also small children, I'm guessing maybe 7 or 8 years old in our group. 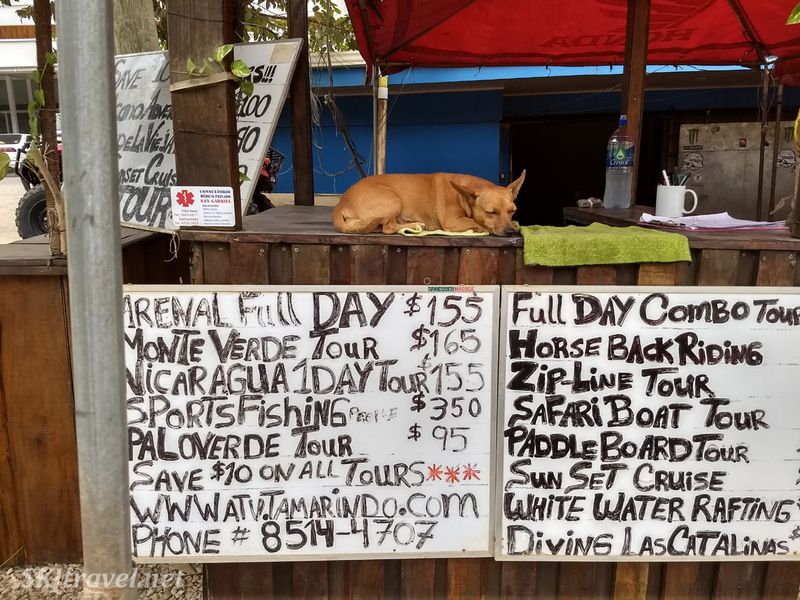 This little dog was offering a list of other activities available, but we didn't book any. Though it would have been fun to book with him, watch him write our reservation ticket with his little paws and give us change with a wagging tail. 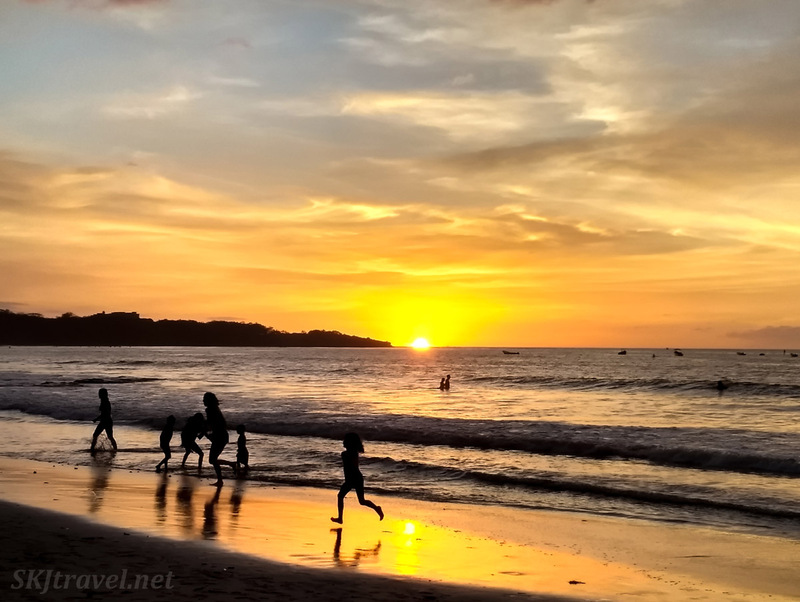 If you want to check out Tamarindo yourself, I recommend the small boutique hotel we stayed at a short walk from the beach, Ten North Tamarindo Beach Hotel. I thought this tri-colored tree trunk was interesting in the hotel's small courtyard. 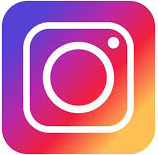 I seem to say this a lot in recent years: there's not a whole lot of rhyme or reason to why I break up and categorize photos in the posts the way that I do. It's just too many photos to put them all in a single post! So here I decided to share some of the other classes of animals we saw -- reptiles, amphibians, birds and insects. Birds aside, the other categories don't normally see a lot of action from my camera shutter. 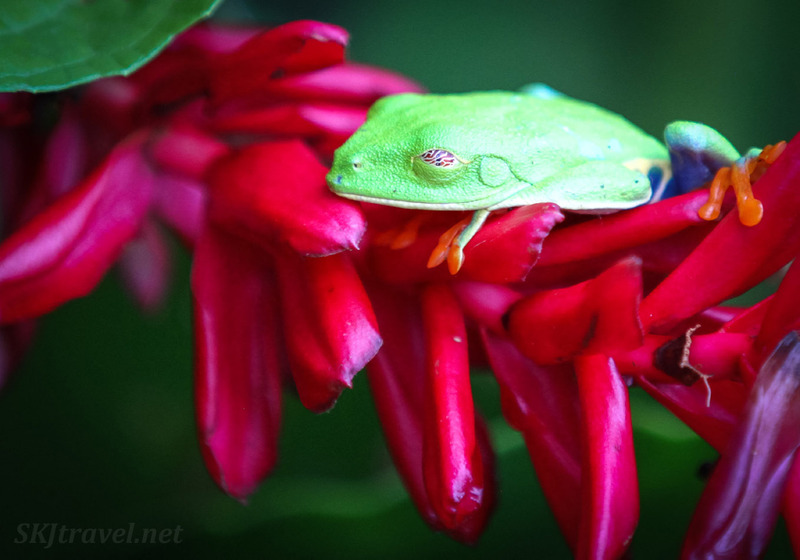 But there were some very interesting and beautiful critters in the rainforest to capture in my camera. 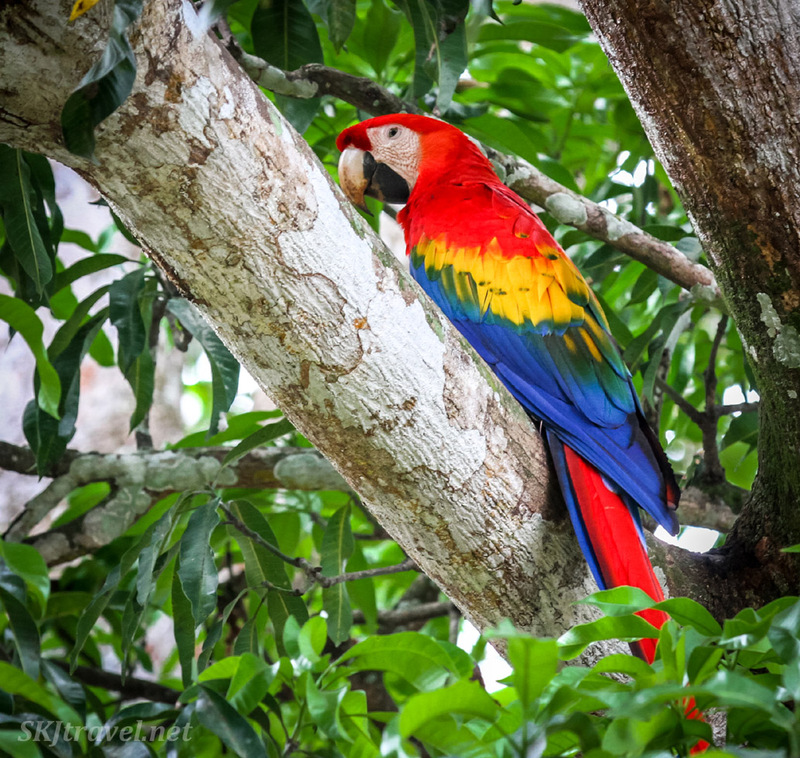 The first truly exotic animal we saw was the scarlet macaw on our way from Tamarindo Beach to La Fortuna. 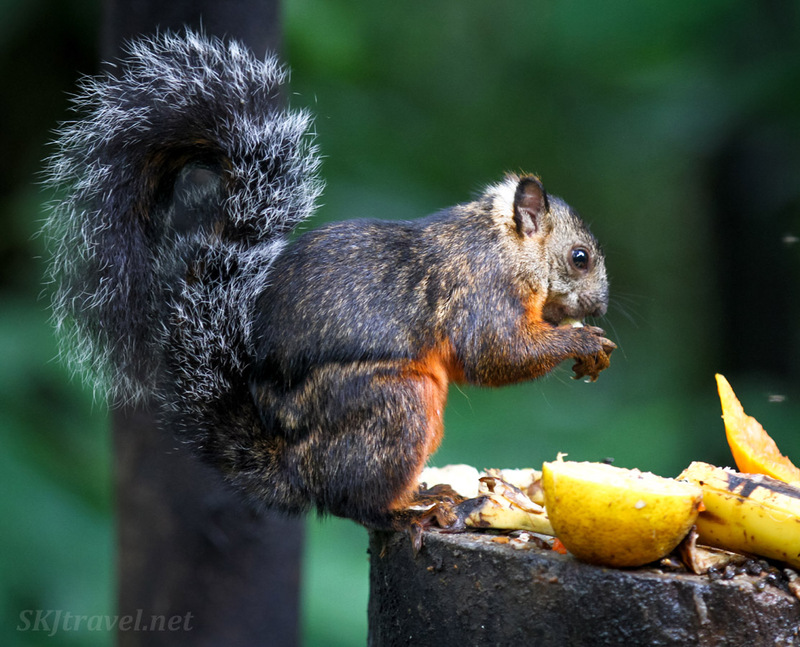 (Most pics in this article came from La Fortuna.) 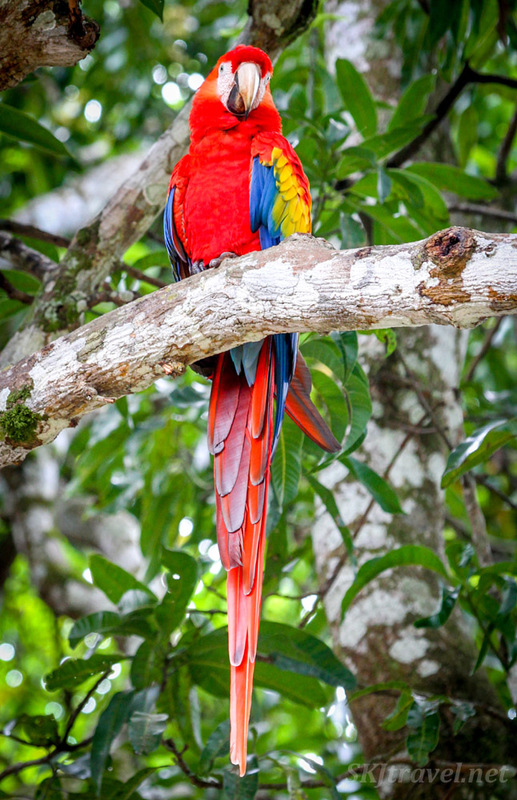 Of all the brilliant, exotic birds we saw in Costa Rica, the scarlet macaw took the cake. We saw a bunch, but they weren't in a tranquil rainforest or nature reserve ... of all bizarre places, a colony had taken up nesting at this place that's basically a transfer station for long distance shuttle buses, where passengers switch shuttles. There are two cafes and a souvenir shop and a large private building with fenced-off grounds, and several very large trees. 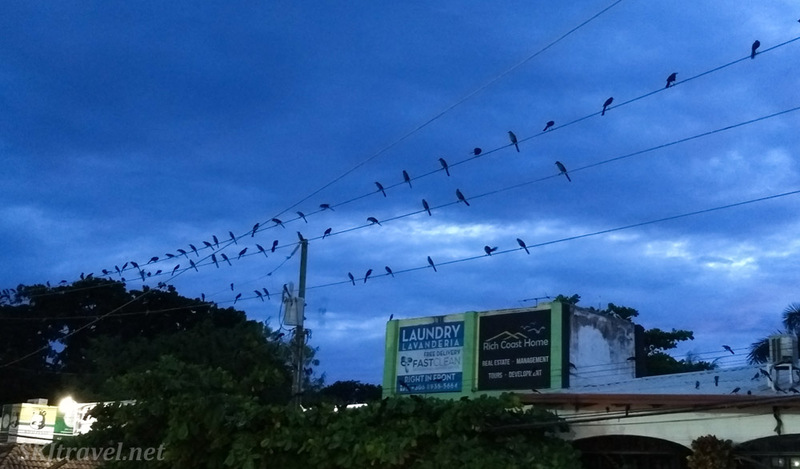 The macaws roost in these trees, right next to a very busy traffic intersection where huge trucks and buses continually pass, and shuttle passengers mill in the parking lot gawking at them. There are signs saying not to feed the wildlife. But I wonder what compels them to stay in such an unlikely and very "un-naturey" place. In any case, it worked well for me to see them! 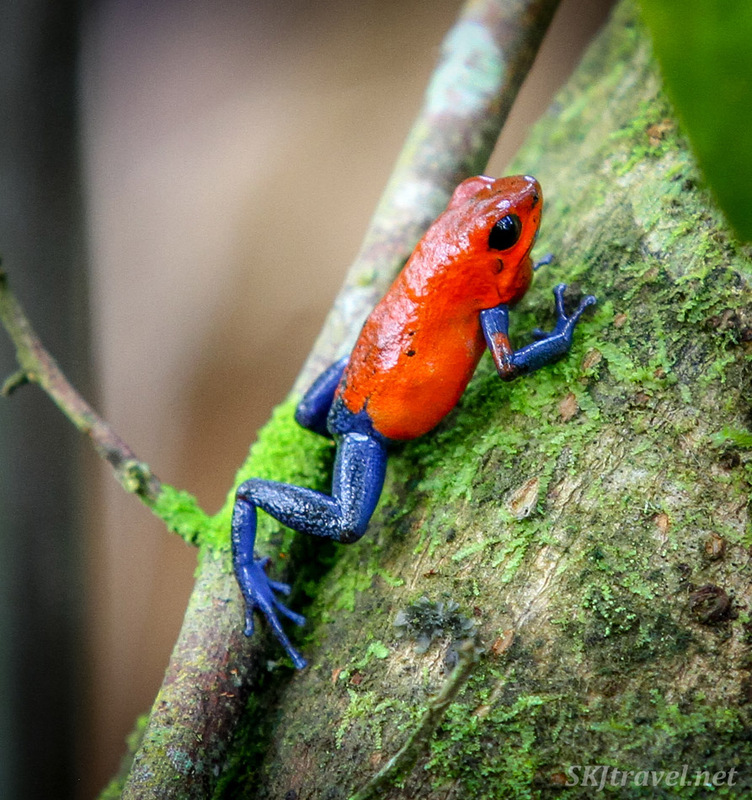 One of the creatures that Costa Rica is most famous for is the poison dart frog. My interest level in amphibians in general is pretty close to nil. The only thing I like about frogs is the noises they make. 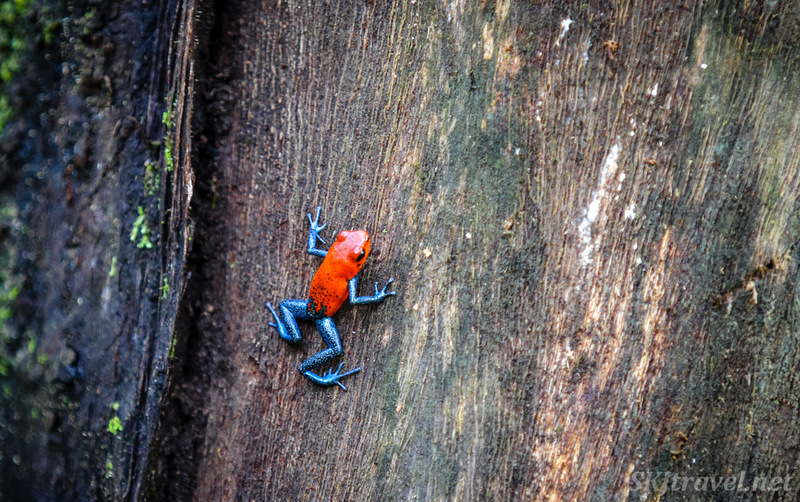 But we saw several types of frogs that were simply beautiful, and one was the brightly-colored poison dart frog, which is very, very small. I knew they were small, but I was surprised to see them only about half the length of my thumb. The frog in the third pic has his throat sack fully expanded in mid-ribbet. I think he looks hilarious and decidedly grumpy. 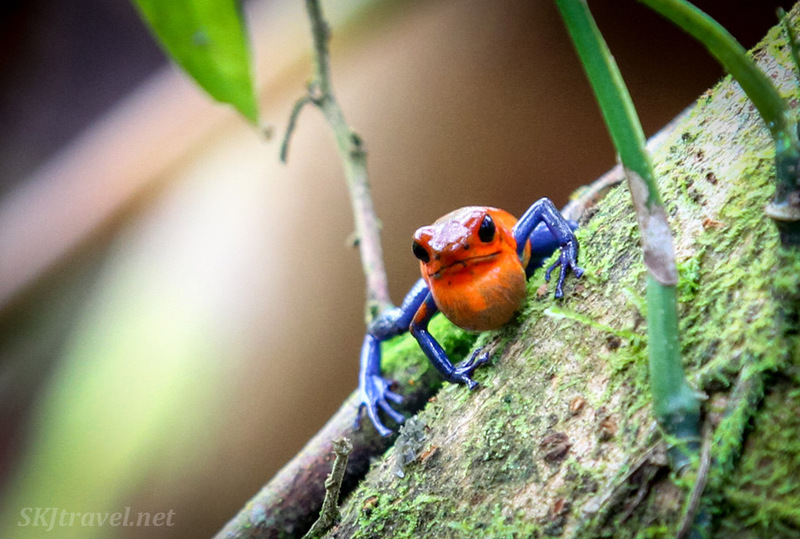 I don't know if the United States has a national frog (I suppose I could Google it), but this is the national frog of Costa Rica -- the red-eyed leaf frog. It's a little unfortunate he's perched on such a brightly colored flower, it makes it harder to discern the color of his toes, so contrasted to his body. 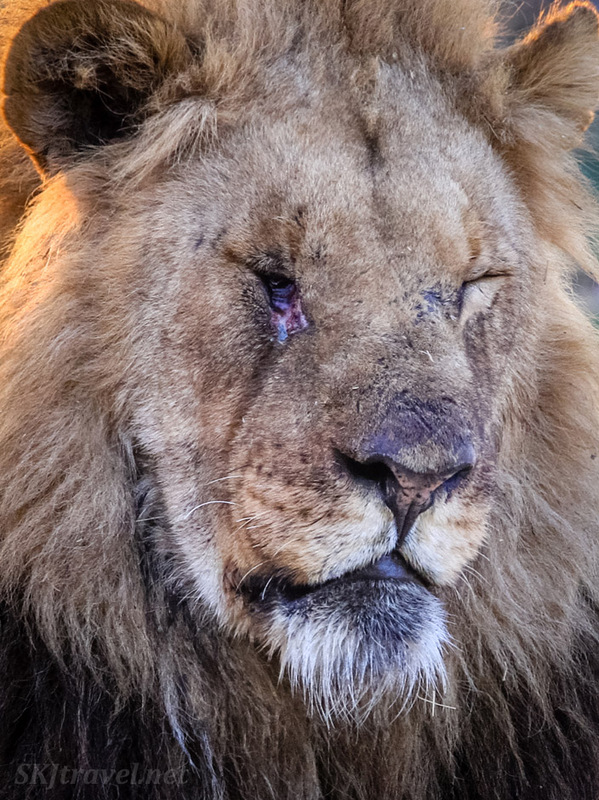 But the most remarkable thing about him is the nictitating membrane over his eyeball. Just like many other animals, such as birds and domestic cats, this frog has an "inner eyelid" called a nictitating membrane that can close over the eyeball to protect it without the animal having to close its "normal" skin eyelid. But this is the trippiest inner eyelid I've ever seen. The frog can still see through its protective latticework. 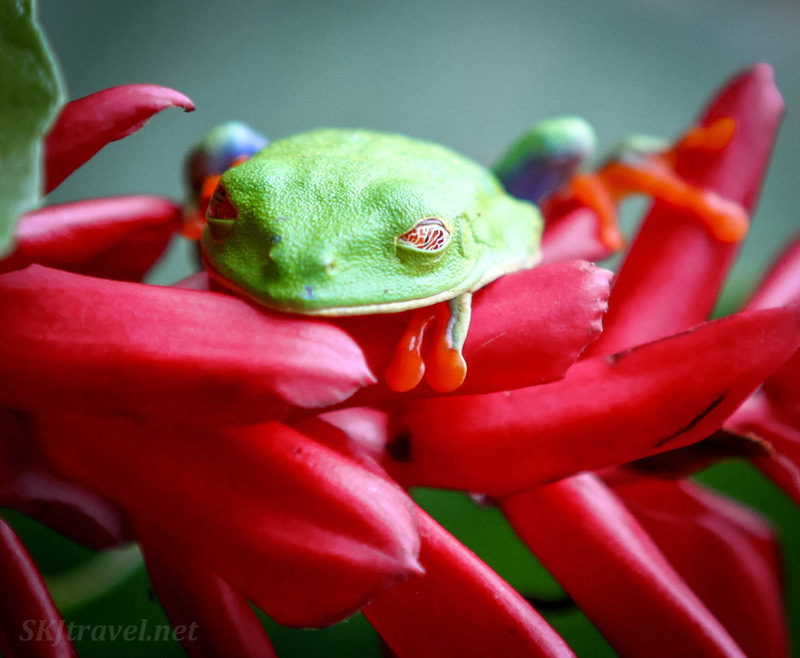 Which is totally cool, but it prevents you from fully understanding why it's called the "red-eyed" tree frog. But I'm going to suppose your imagination is bright enough to figure it out. Here's one of the many awesome things about photography: I think it's cool to capture an animal, especially an uncommonly-captured animal, in my camera no matter what that animal is. Under normal living circumstances, lizards and amphibians and most insects, and most definitely snakes, would cause me to react in a spectrum of ways from mumbling a slight "ew," to a gasp and a step backward, to full-on running and screaming (big spiders cause that). I haven't run unexpectedly into a snake in the true wild when we are both on the ground (so by saying that, I just ensured that such an encounter is imminent), so I'm not sure what my reaction would be, but I'm theorizing something polar to my reaction to spiders ... something like paralysis and maybe some pant peeing. Well anyway, when our guide on one of the sloth tours (Callidryas Tours, which I recommend, as well as our specific guide, Gerald) asked us if we wanted to slightly delay our breakfast in the bird garden to go see if a viper was still around where he'd seen it yesterday, I found myself excitedly saying, "Yes!" I guess maybe I think with a guide, he will ensure my safety. (?) I don't know, but the prospect of getting a good photo of a venomous snake actually excited me. 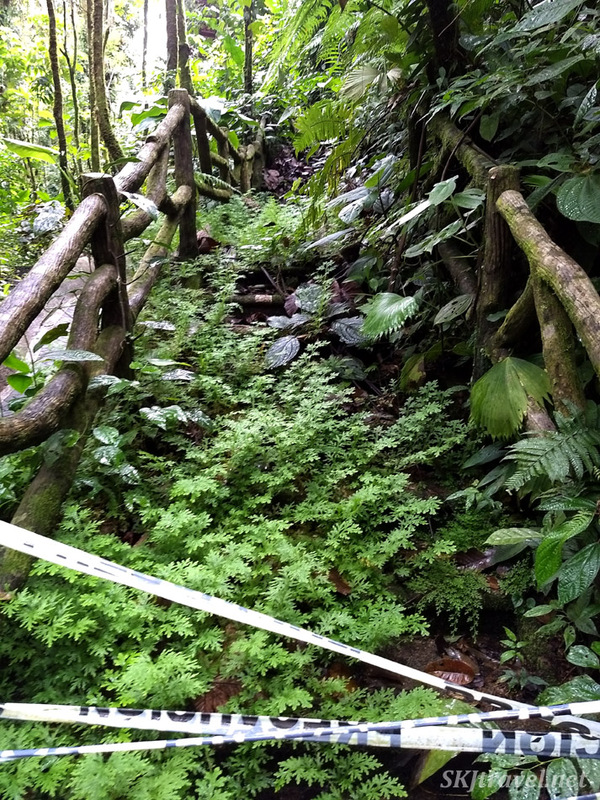 So we walked a short distance down a path through the rainforest and then the guide stepped off the trail just a few steps and told us to be very careful as he motioned us toward him. Now, when he said let's go see a viper, I imagined a regular-sized snake, which to me means something like maybe 4 or 6 feet long, maybe a slightly plump tube. Briefly, scenes of other gigantic snakes I've encountered flashed through my head and I did worry slightly it would be one of those ... (for example, in Botswana, and the craziest day of my life in Uganda). 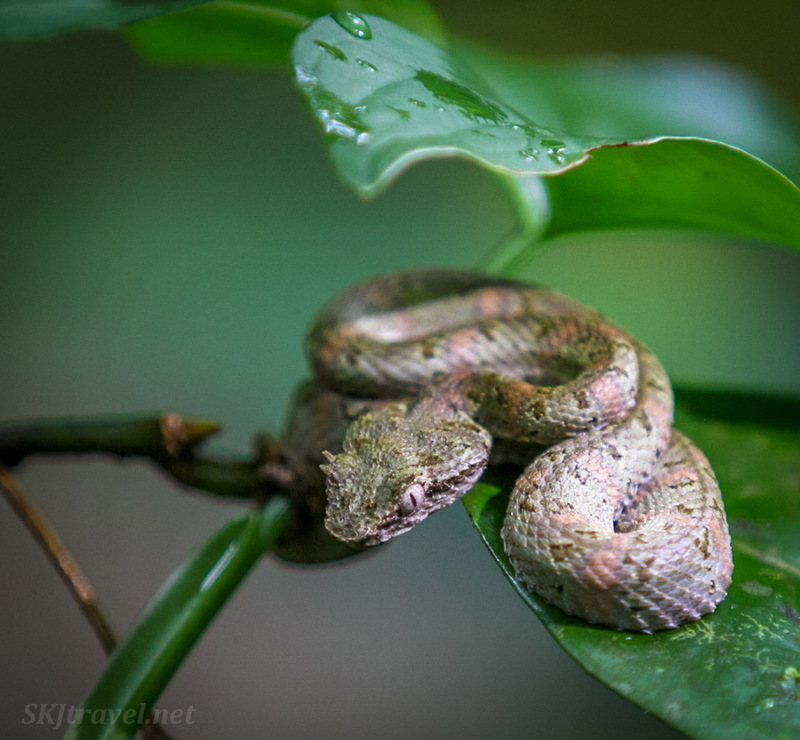 So imagine my surprise when I followed the guide's pointing finger down to this teeny-tiny little snake curled up on a leaf. My goodness, how would you even spot that tramping through the forest? It just makes you realize that there are critters absolutely everywhere that we never even see. The first pic is blurry, sorry, camera had a hard time focusing on its head, but it gives you the sense of scale for how tiny it was. Its venom, though, would not have merely a tiny effect on me! or you! The second pic, you can see his creepy iconic viper head. 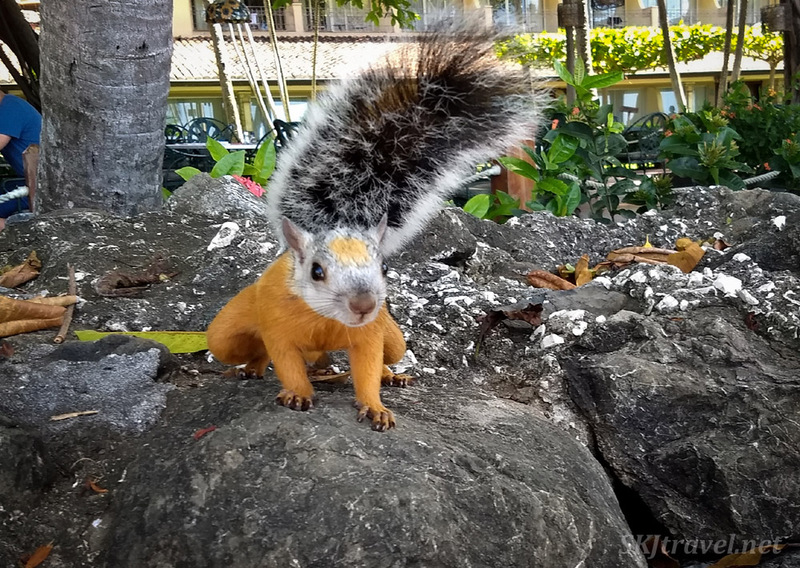 So after getting some pics of this delightful (ha) fellow -- though, I must admit, its coloring, almost pastel, and pattern is really quite lovely -- we walked back to a little outdoor cafe to eat breakfast. 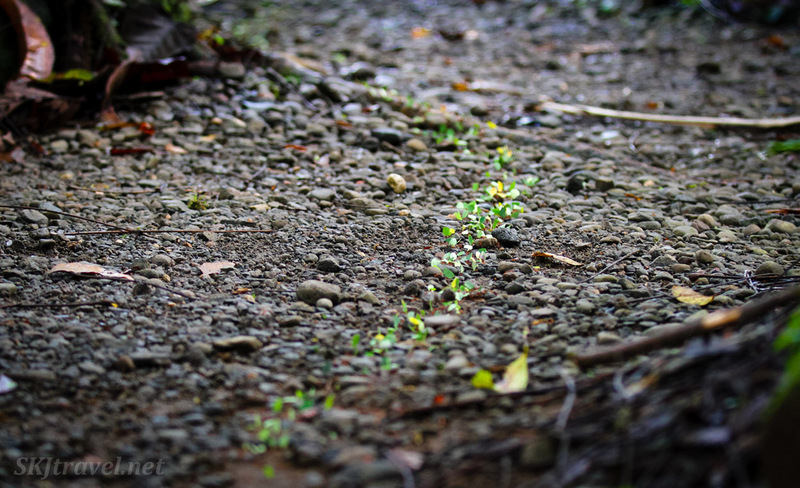 But along the way, we saw what ultimately I would name as the coolest thing I witnessed in Costa Rica: a virtual river of leaf-cutter ants. Now, I've only seen this incredible society of insects on TV nature shows, and found them fascinating on TV. The evening before, Erik and I ran across them by ourselves walking through a park where we took a different sloth tour. It was getting very dim, after sunset, and we already knew well enough (from previous traveling experiences) we did not want to get stuck out in the rainforest in the dark, and therefore didn't spend too much time watching them. So this second spotting it was fun to be able to really watch them at leisure. It's really something else to be walking along through the forest and look down to see this line of leaf bits moving briskly down the trail beside you. Then you bend down and look closely to see there are just as many ants carrying leaf bits back to their nest as there are ants heading back empty-handed to the leaf source to cut more down. I did not have a camera on me with macro capabilities, so I really couldn't get a worthy picture. I tried videoing them on our little cell phone camera, but it didn't do the scene justice either. But you can see in the photo a little patch of the ants carrying their leaves ... now imagine that's not just a patch but a continuous line that flanks the path, crosses the path, goes over rocks and under tree roots, is so well-worn that there is an actual groove that the ant corps has worn into the ground. Can you guess how long this line of ants stretches? The guide said for one kilometer. I followed it for as long as I could until it disappeared into a wall of bushes. But just imagine following a constant stream of moving leaf bits, carried on the backs of ants, for a kilometer. I don't know how to really describe it and how interesting, unexpected, unique and rather phenomenal it is. Want to learn more about leaf cutter ants and what they do with all those leaves? As long as you are not a "mature audience only" and have a sense of humor, check out the True Facts episode. It's the quickest and most entertaining way to learn about them. Freaky little them. 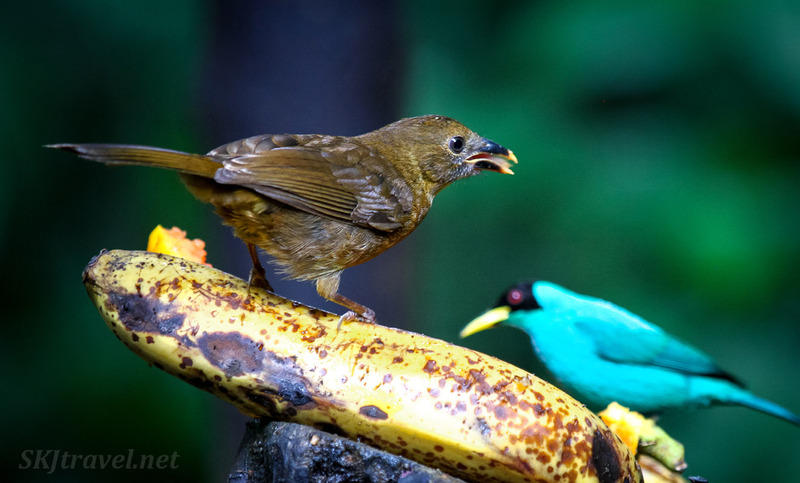 OK, so anyway, after making it to the breakfast table, we enjoyed watching an array of colorful birds come to their own breakfast at little feeding stations sporting a variety of fruit, set up just outside the cafe to attract birds for the tourists to be able to see. So ... here is a sampling of who we saw at the avian breakfast table. 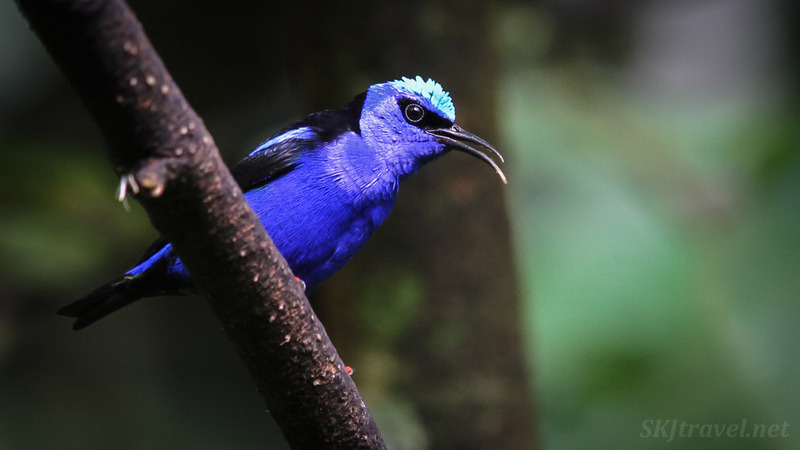 The red-legged honeycreeper. I barely caught a glimpse of his legs here, but rest assured, they are red. 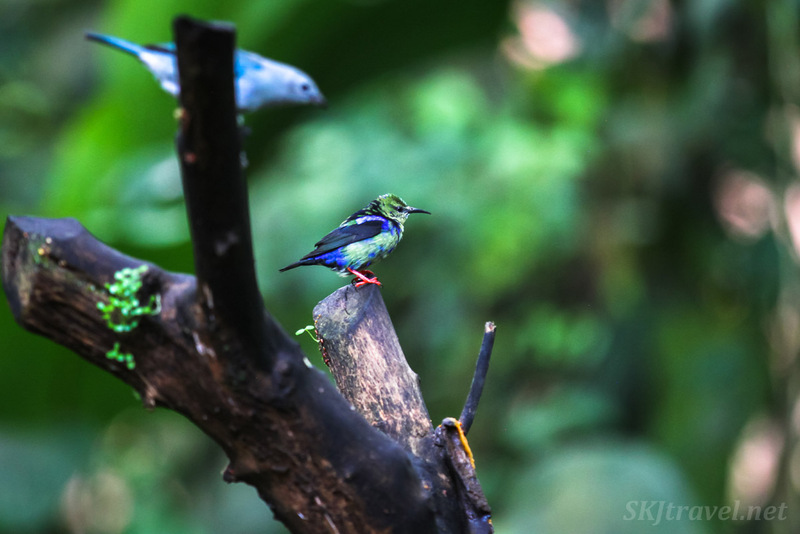 And a juvenile red-legged honeycreeper. I had to ask around my Facebook birder friends to get this ID ... I figured it was a completely different bird! But it's just a young 'un, above is the adult. 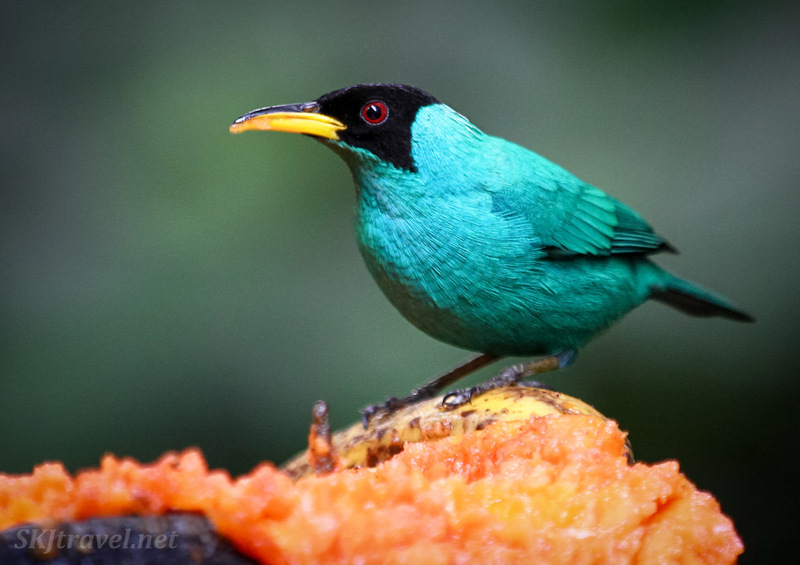 This green honeycreeper was happily perched on a banana until he had to share it with Costa Rica's national bird, the clay-colored thrush. I think it's a little amusing that for all the super colorful exotic-looking birds in the country, they chose a rather plain brown one to represent it. 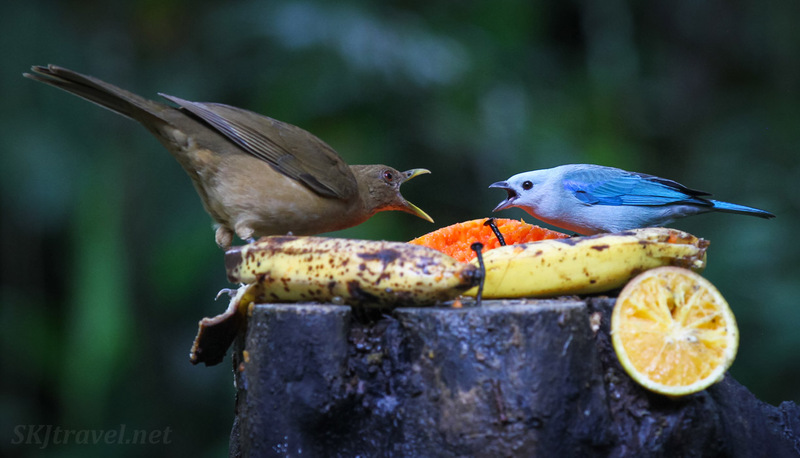 The national bird seems to have a lot to say to the surrounding birds at the breakfast table. 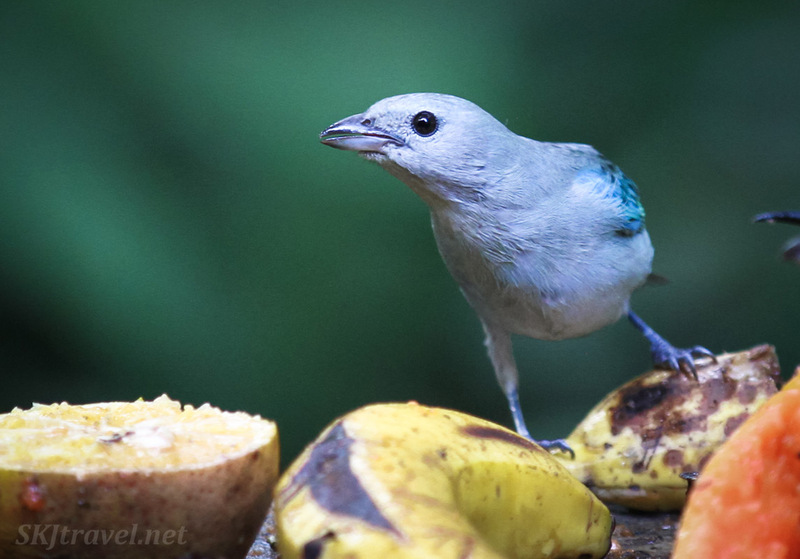 Here he's having words with a blue-gray tanager. 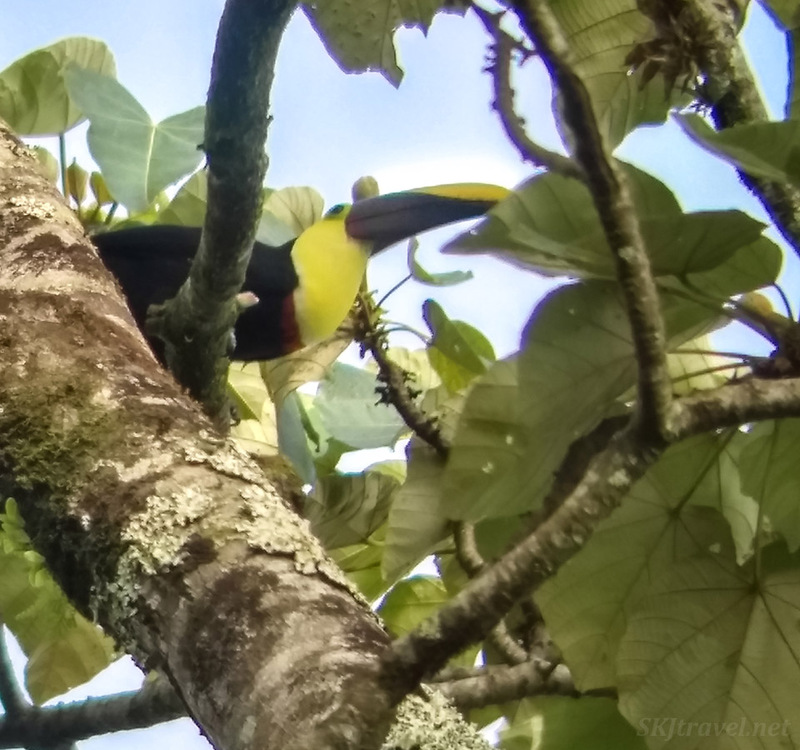 Before breakfast while we were in the field looking for sloths and poison dart frogs, our guide spotted this toucan and got a picture of it for me by putting my cell phone camera up to his binocular scope thing (looks like a telescope but operates like powerful binoculars). Ain't a picture to write home about, but it proves I saw one! 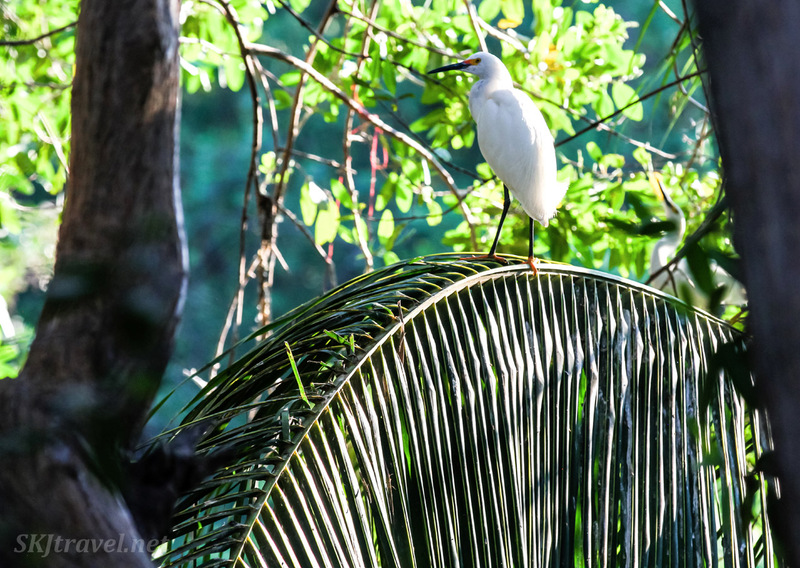 Elsewhere in La Fortuna, on a nature trail called the Bogarin Trail, we saw this boat-billed heron, which I've also spotted in Mexico. 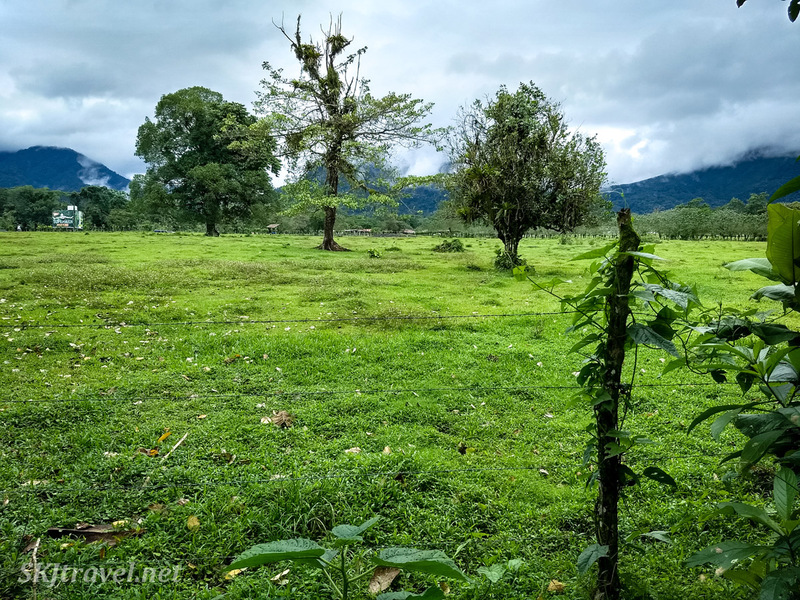 We didn't see as much wildlife on this walking tour, but what was remarkable about it is that this park used to be just muddy pasture land for cows. Then Giovanni Bogarin decided to turn the land into a nature preserve and trail. 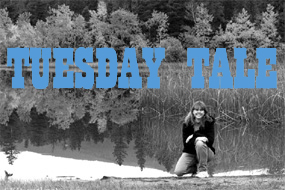 Who would have a thought to turn a cow pasture into a nature park? Well, someone who understands the fecundity of rainforests, I guess. 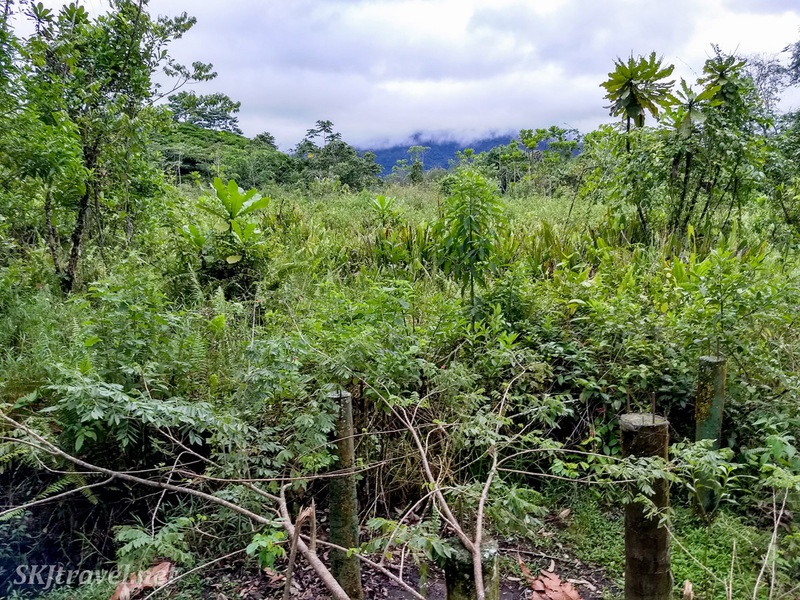 Do you know what Mr. Bogarin did to start and grow this dense, lush rainforest full of birds, snakes, leaf cutter ants (the first ones we saw) and sloths? I was rather astonished at the answer: nothing. Nada. Didn't plant seeds, didn't import animals, didn't water or tend anything. He simply didn't clear away anything that grew naturally, which otherwise the cows would graze down if it was pasture land. Birds from nearby areas brought seeds over in their poop. 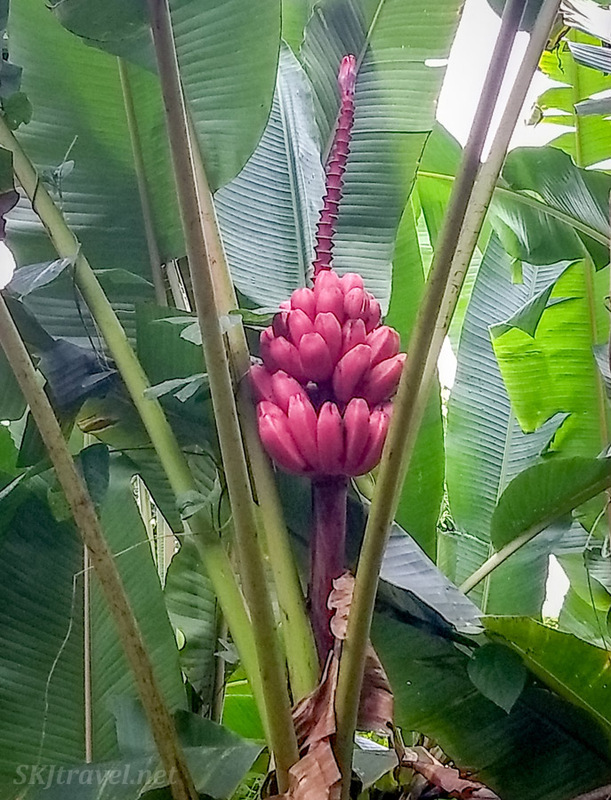 In the rich volcanic soil and copious rain, the seeds grew vigorously all on their own. 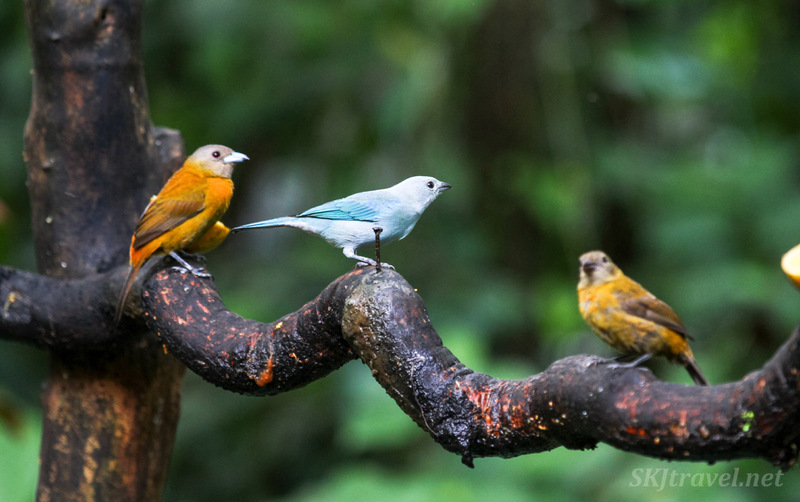 Once there was some plant life, birds began to stay and hang out in the trees and bushes. And after that, other animals moved in to the habitat, continually seeding and growing itself and providing plant food for herbivores and subsequently meat for carnivores. This is the pasture land. We're standing inside the Bogarin park looking over the fence that sequesters this urban rainforest from the pasture. And how long do you think it took for this amazing transformation to take place? To go from Picture 1 to Picture 2? It's been 25 years since Mr. Bogarin stopped grazing cows on the land. 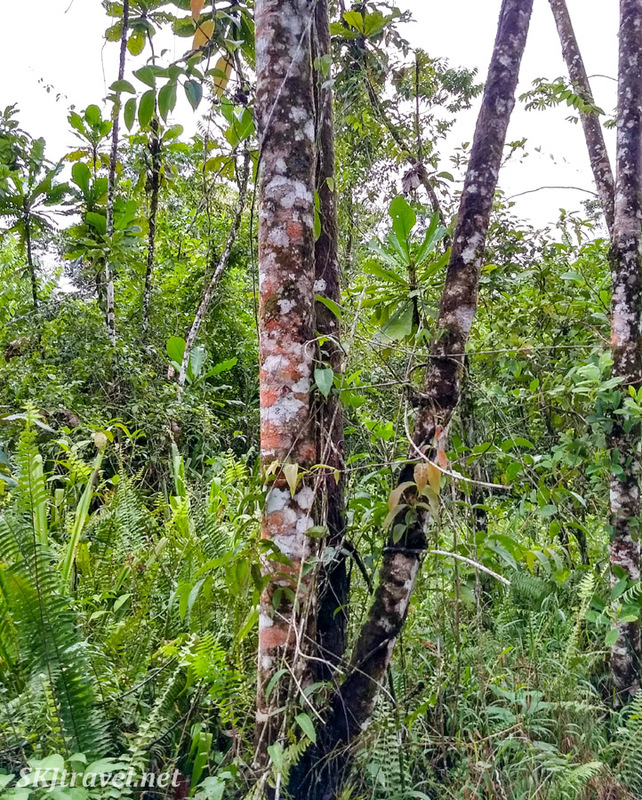 Someone fluent in rainforest ecology could tell that, as our guide explained, an older rainforest has much taller trees, but I wouldn't have realized that until he told us. It's so dense, you couldn't walk through it without a machete or something to clear your way! If you step off the pathway, it feels immediately claustrophobic, surrounded by plants so numerous they seem somehow voracious, like carnivores, waiting to devour me and ingest me into the forest mass. 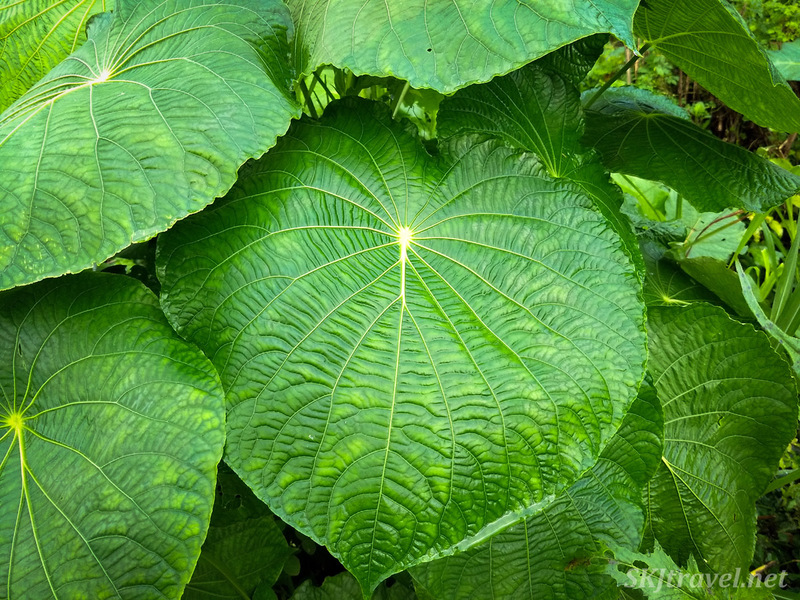 And of course now we know that tiny little vipers and other poisonous snakes and frogs can lurk anywhere, on any of these leaves we brush against! Closer to home, we had this visitor, or perhaps he was hotel staff, at our hotel most days. 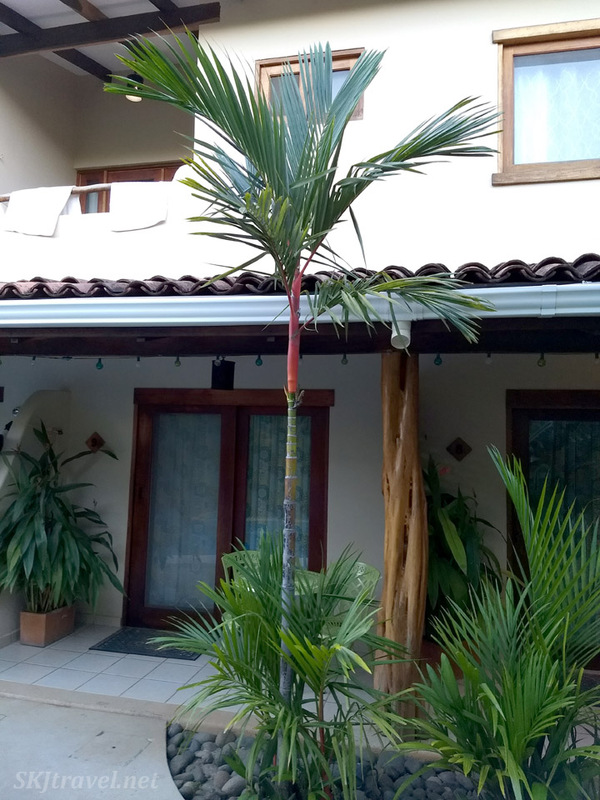 We stayed at Ten North Beach Hotel in Tamarindo, and I have to say that I'd really recommend it. A small hotel, only a few minutes' walk from the beach, but far enough away to feel quiet, calm and secluded. Just a few apartments on the bottom level and rooms on the second level, all in a square around a courtyard with a small swimming pool and lounging beanbags in a sand pit. If you're in an apartment (as we were), they serve you hot breakfast right to your patio, and if you're in a room, you eat in the small courtyard. 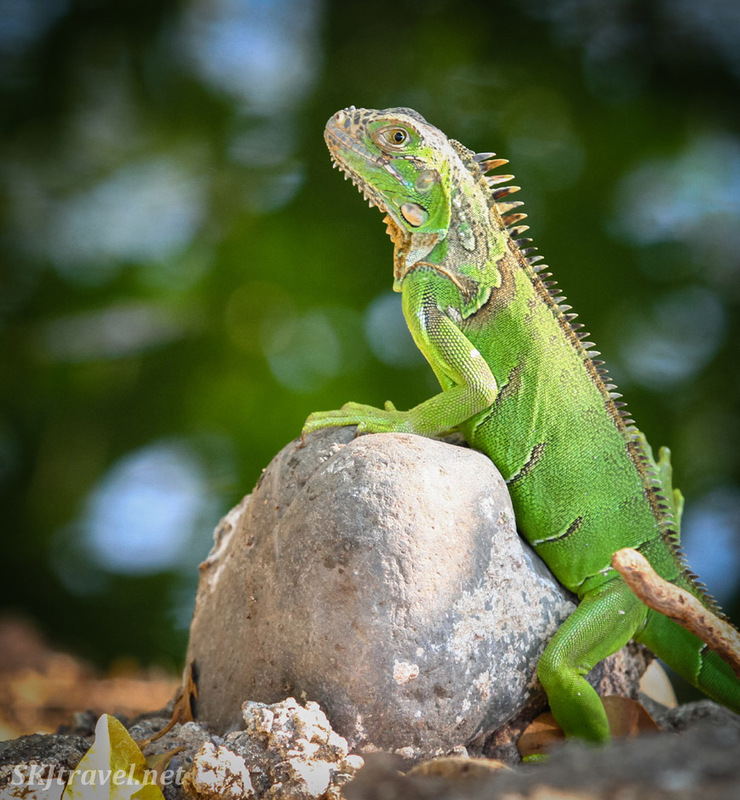 Anyhoo ... this was our iguana friend, often to be found on the roof tiles. 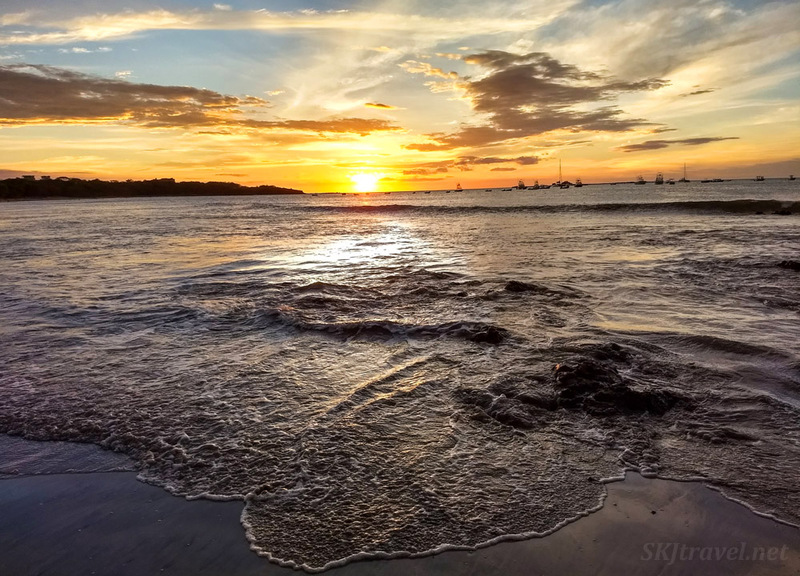 One of the most enjoyable activities we did while staying in Tamarindo was going to the beach to watch the sunset each night. 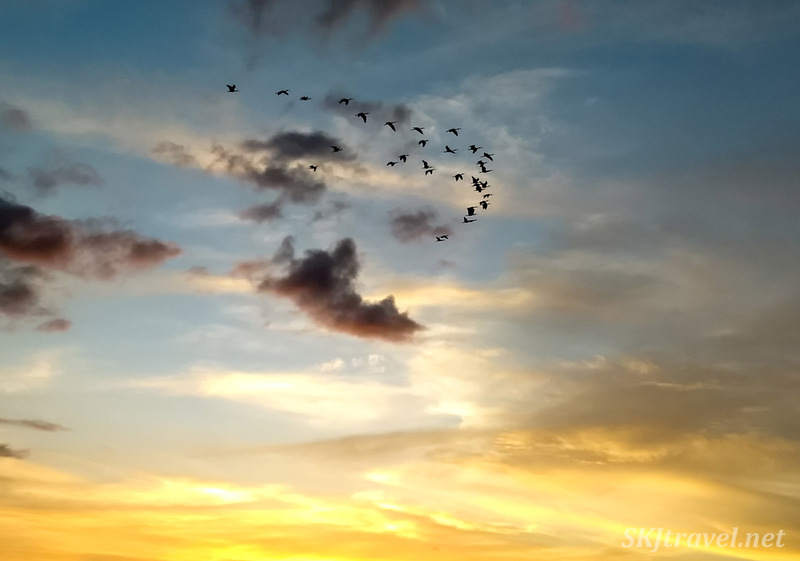 Birds flew overhead. 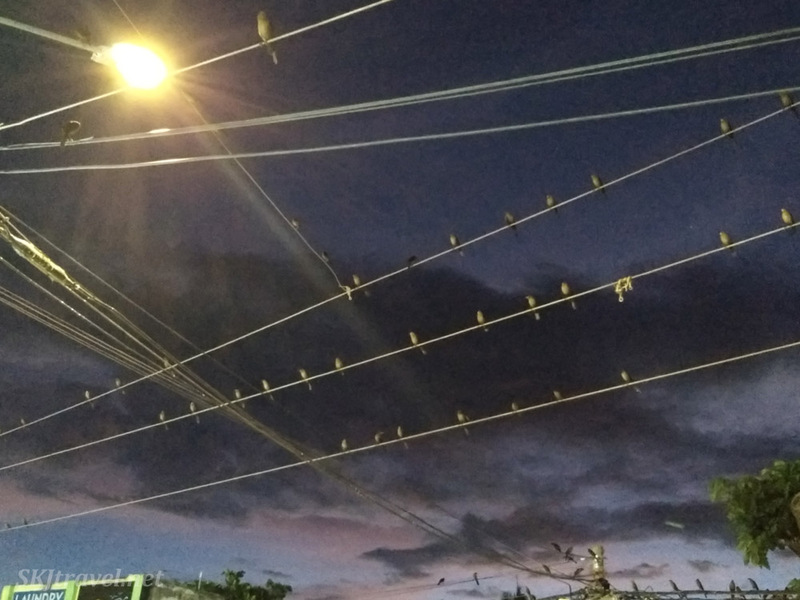 Every evening on the way back home, tons of birds would be perching on the electrical wires over the street, settling in to roost for the night. The sound of them all was quite impressive. I didn't get particularly representative photos of how many there would be, as sometimes a long wire was covered with birds shoulder-to-shoulder, but here are a few captured on my phone camera. I leave you with one last non-mammal creature ... in accordance with the title of this post. 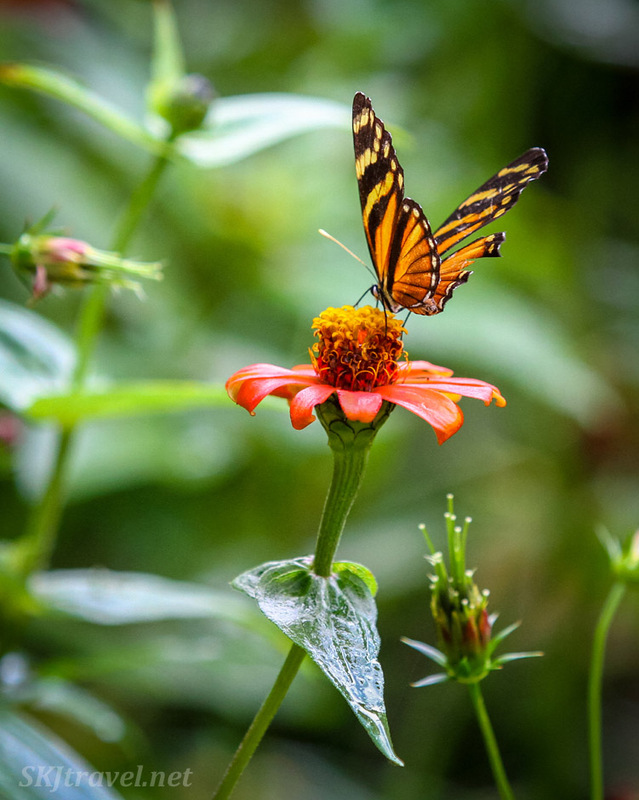 A butterfly, with a damaged wing, but pretty nonetheless, in the "butterfly garden" at La Fortuna Waterfall. And BTW, it was the only butterfly we saw there! haha. Presumably at some point in the year there will be more to justify the label, "garden." Or else this guy's got a palatial pad all to himself. I don't normally give a nod to the accommodations we stay in, since I'm in the business of narrating, not rating and recommending, but I'm kind of changing my tune that I should start mentioning businesses that make our trips enjoyable, as I often get contacted with requests on how to do what I've written about. So Erik and I stayed at the very affordable Hotel Secreto for our overnight excursion to La Fortuna. Very well located for walking to restaurants and even to the Bogarin Trail. Very nice proprietor, and a mama and baby sloth hanging out in a tree right outside the reception area! And we very much enjoyed several rounds of beer at the La Fortuna pub, I believe the only craft-beer brewery in that area. Delicious beers and a super friendly proprietor with whom we chatted for quite awhile. One evening in Chobe National Park in Botswana’s Okavango Delta, we came across a dead elephant, a young bull, in the bush. Alone, collapsed on his side. There were no predator marks on it nor any other animals near it. The scene was spookily quiet. We asked our guide what happened to the elephant, he said perhaps some illness or perhaps just the heat if the elephant had gotten dehydrated, it wasn't uncommon. 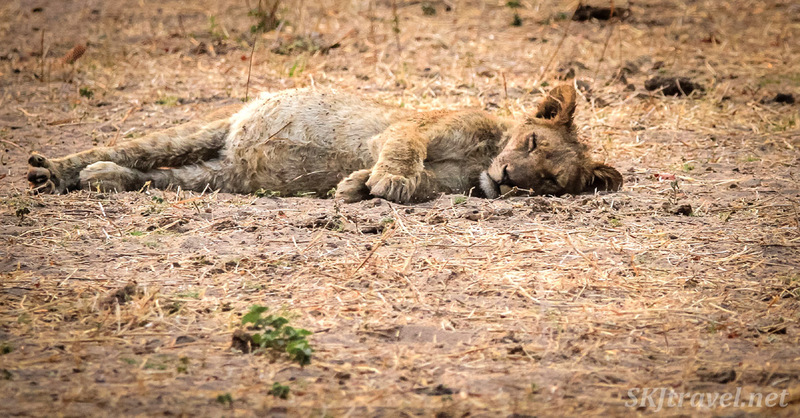 (in case you’re wondering if it’s hot there, see my post, "A Typical Day") He said we should come back in the morning, the local lion pride would surely be feasting on it by then. 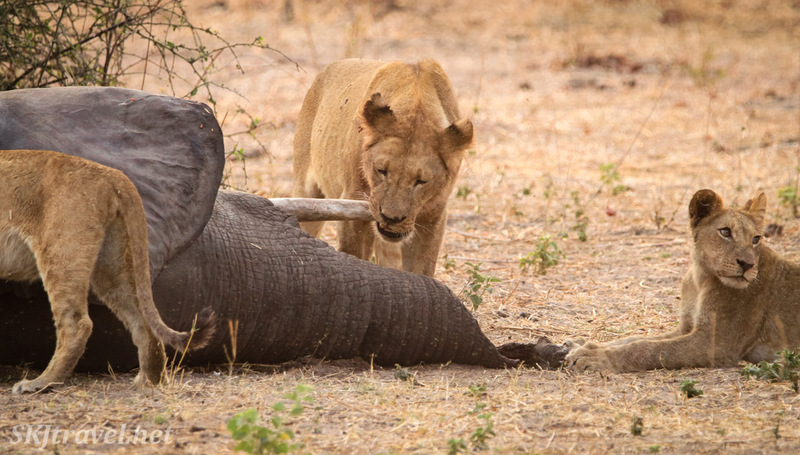 The death of this elephant, lying all alone, seemed intolerably sad, although it was nothing more or less than the natural course of a life in the wild. We drove back to camp at dusk. 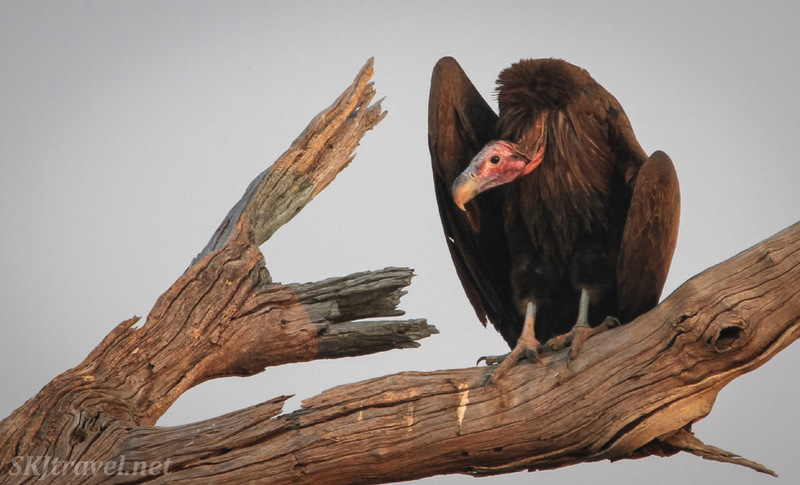 We could make out lappet-faced vultures and other carrion eaters perched silently on the bare branches of skeleton trees nearby. As night unfurled her cloak around us, their features melted away to become ominous silhouettes in the dusky sky. The phrase, "the dark heart of nature," kept floating around in my head. This is the first safari I've been on where I noticed so many injuries on the animals and saw so many dead. I've seen some injured zebras before (from lion attacks) and maybe another injury or two, but the beauty of this place, the Okavango Delta, was regularly balanced with the harsh underside of that thriving grace. Is it that I simply saw more animals? That we spent more time in the parks (the longest safari I've been on)? Is it a harsher place? Looking through my photos, even aside from the obvious injuries we saw, I found many animals with smaller wounds and infections. Maybe my camera is just better? 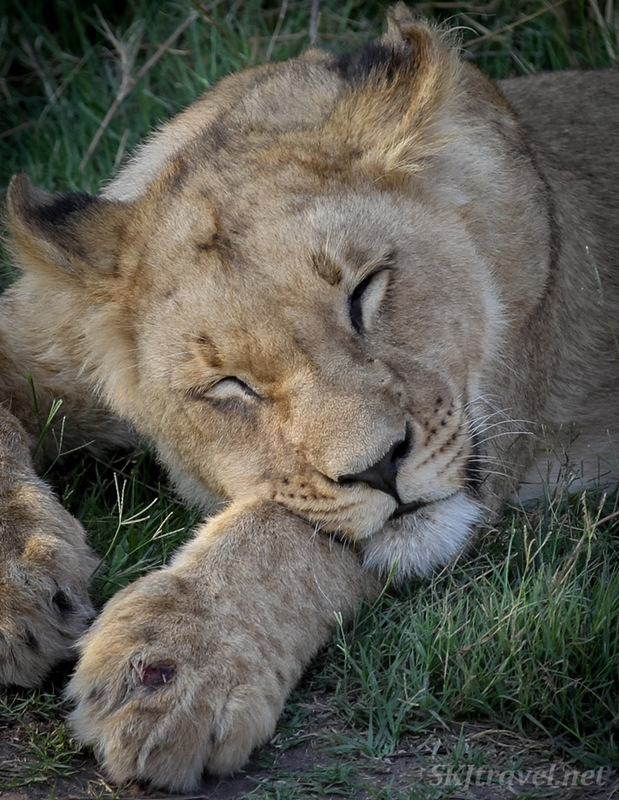 Even the little lions in Khwai had boo-boos all over their legs and paws. Some of these animals I didn't even take a picture of, it felt awkward to capture the suffering. In Savuti, we saw a wild dog with a broken front leg, it was just dangling down uselessly from the completely broken bone. 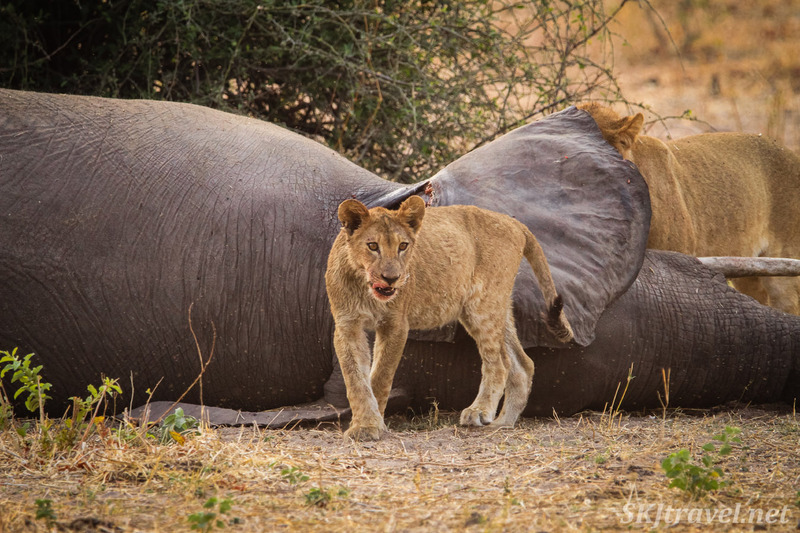 Another guide said a hyena had injured it in a scuffle for food almost a week earlier! And yet that dog was still leading the pack like an alpha on three legs, though it must be in excruciating pain. One of the mornings in Khwai when we were watching the wild dog pups, the entire pack abruptly took off chasing an impala and one little puppy was left behind, looking all around for his mates. Then one more came through the bushes and so it was two of them frantically looking around like precious lost souls; they had expressions of panic on their little faces. I felt so bad for them, they eventually disappeared together into a bush -- at least they had each other. Our guide said the previous year the pack lost all its pups. 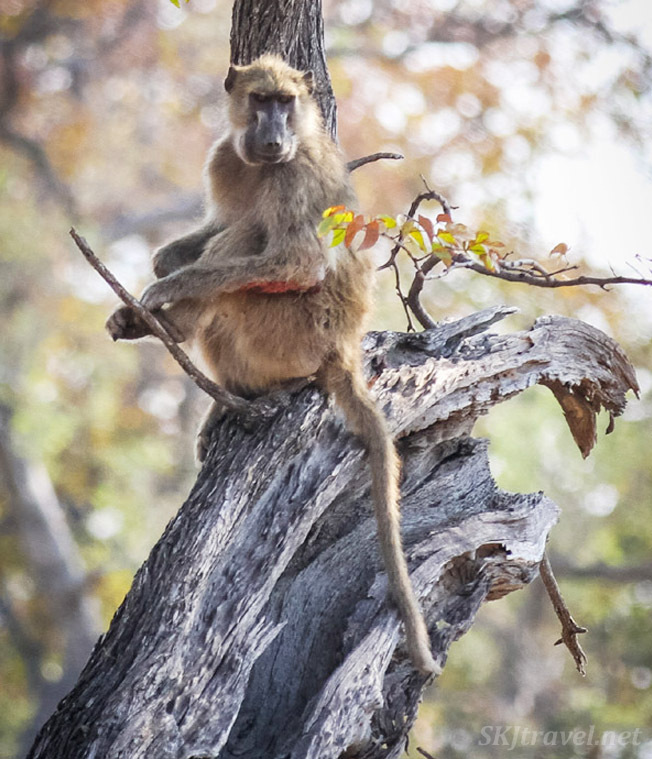 The first baboon has a large gash on the underside of its forearm; the second mother baboon is thriving in spite of her injury (or perhaps a deformity since birth). 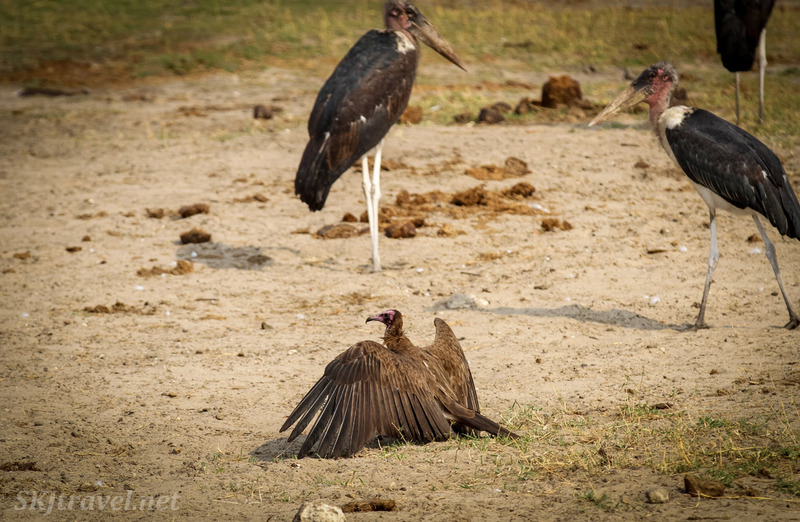 There was one day in Chobe that I thought of to myself as "the morning of death." 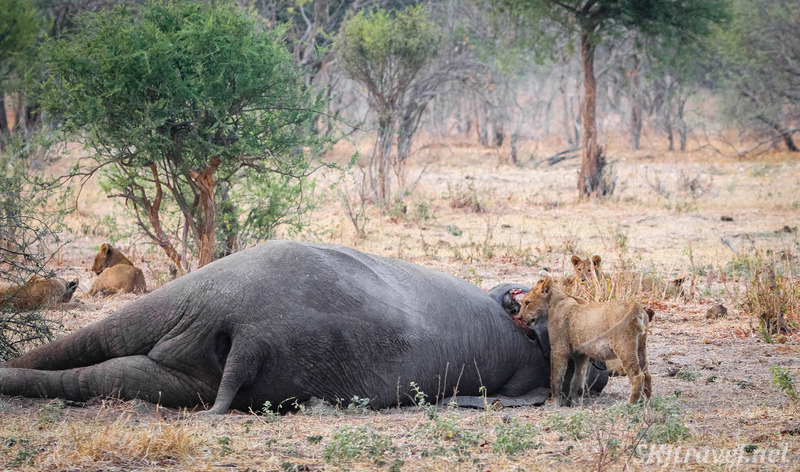 We saw two dead elephants -- the one mentioned above and one in the river -- a dead and half-eaten genet on the ground, a dead impala in a tree that a leopard had stashed, a zebra that had been attacked by a lion, his hind quarter just a big square of red raw flesh. And later that night a baby elephant limping and falling behind its mother, putting no weight on its front foot. Our guide said it wouldn't last. But I did take pictures of the elephant that collapsed next to the bush. 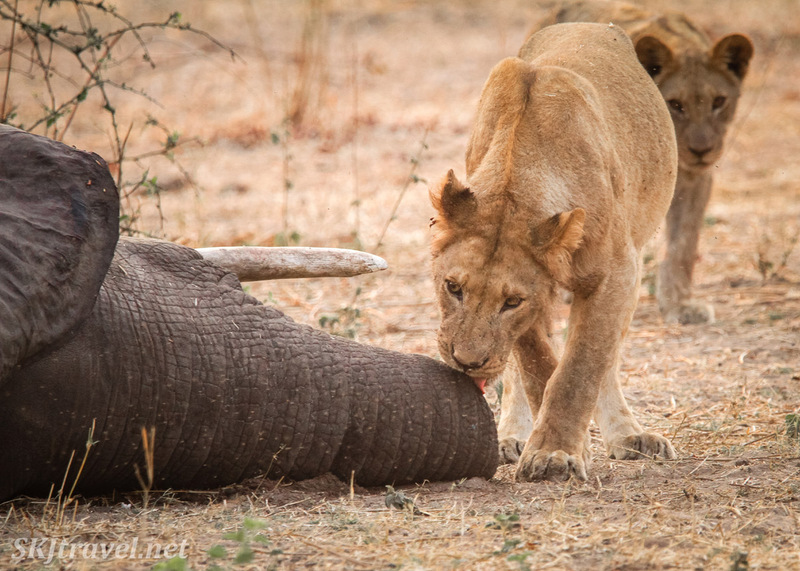 Everyone, including myself, was keen to see the local lions feed on the elephant. Why should we be yearning to witness something so gruesome? We wanted to see the raw side of nature for ourselves; we wanted a proximity to reality, beyond the pretty perfectly-posed animals, to see how they stay alive, watch them feasting with the savagery of an apathetic nature. But in the end, it wasn’t savage at all. 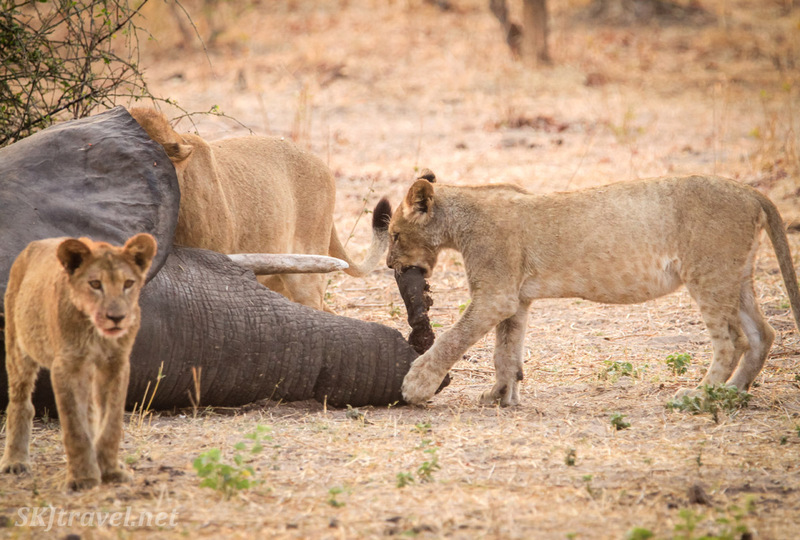 The young lions were playing with the trunk like a toy and gnawing on the dense tusk. It was hard to be much more upset about that than watching a domestic cat play with an insect or a dead mouse. 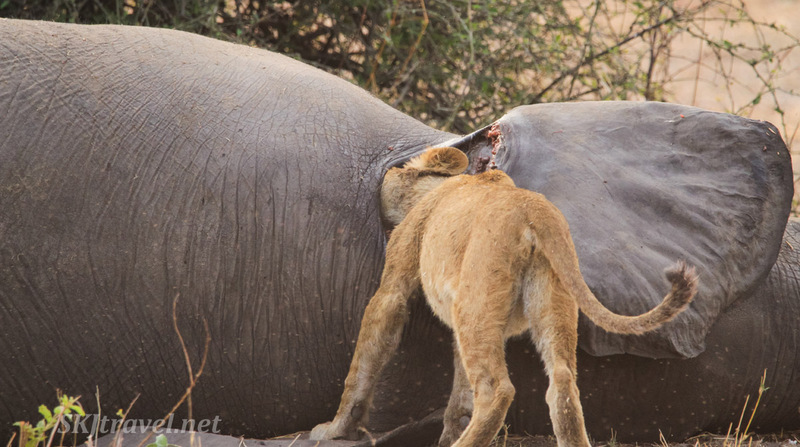 It was fascinating to get a sense of scale for the elephant when a lion’s head would practically disappear inside the hole that had been opened up in its neck. One little cub was bloated into a food coma, his tummy stuffed taut like a balloon. That was downright adorable. He won’t be needing to eat for a few more days! 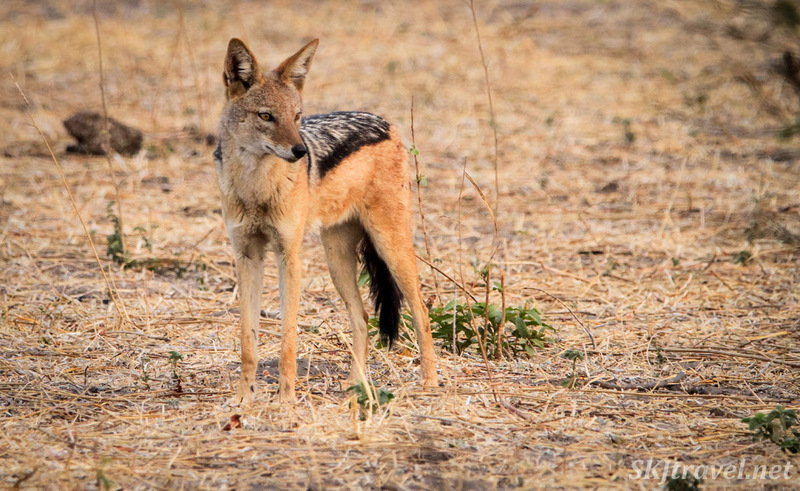 A hopeful black-backed jackal kept his distance from the lions, waiting patiently for them to leave or fall asleep before stepping in to grab a meal for himself. He stood in the distance and eventually curled into a ball and took a nap to pass the time until it was his turn at the feeding trough. Seeing the dead elephant the night before lying unmolested, untouched, simply collapsed, from heat or thirst perhaps, was profoundly more sad than seeing it torn and burrowed into, lying partially eaten in the sun. 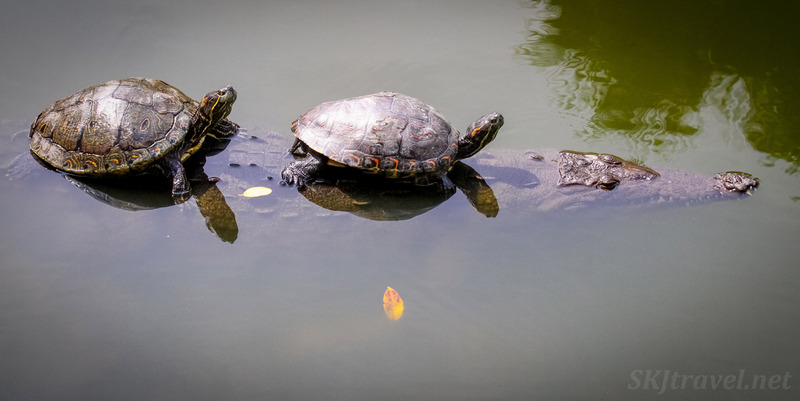 To have fallen alone seems more tragic than to be a part in the proverbial circle of life, the epic dramas that result from the struggle of predator against prey. I was glad to see him taken into this circle. Still, "the dark heart of nature" kept running through my mind. It still does. Is it a dark heart or an apathetic heart that beats in the wilderness? It seems dark because there is life and therefore joy in death, and we would feel like monsters if we saw human death in the same way. But to be left alone in indifference, for such a majestic animal to decompose and disintegrate, to be embraced only by lifeless forces -- wind, rain, sun -- feels more emotionally brutal. Which is weird that a lack of emotion in the universe evokes a stronger emotion in me. So I guess I'd rather there be a dark heart than no heart. 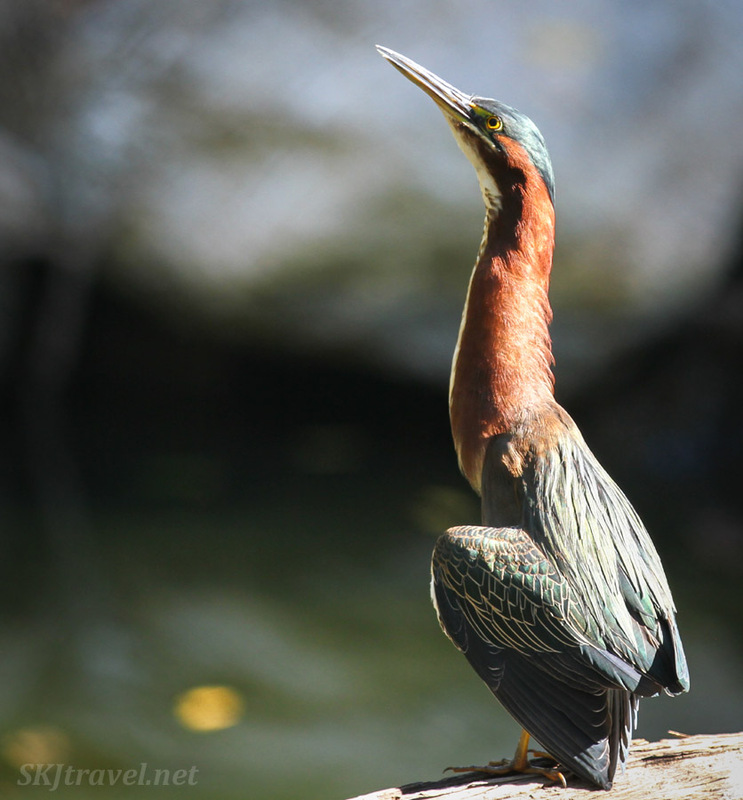 I feel I hardly need to provide an introduction to this post ... but if this the first Mexico trip you've joined me on, the following are photos from my favorite little lagoon at Playa Linda, Ixtapa, Mexico. 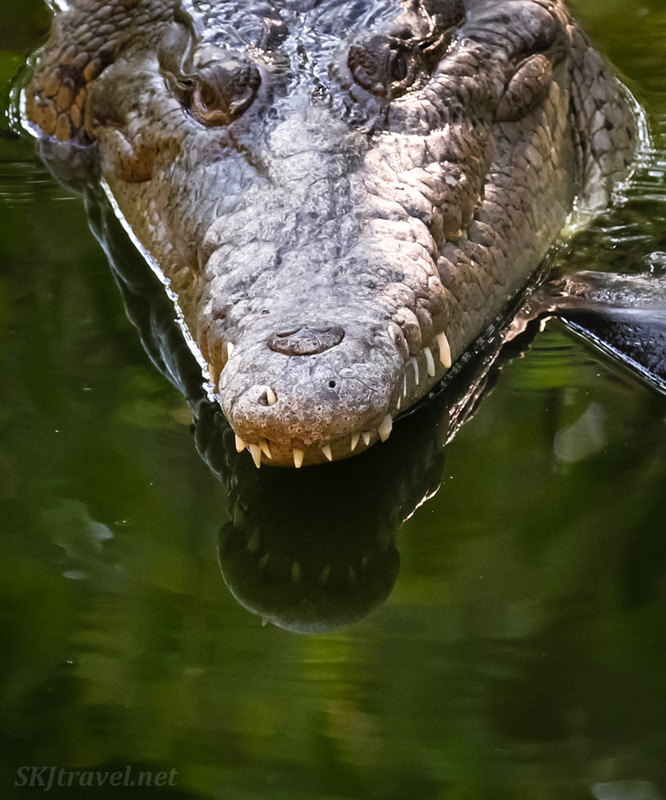 It's known by several names: the crocodile farm (but it's not a farm), the crocodile refuge, the crocodile reserve, Popoyote lagoon, and probably by others. 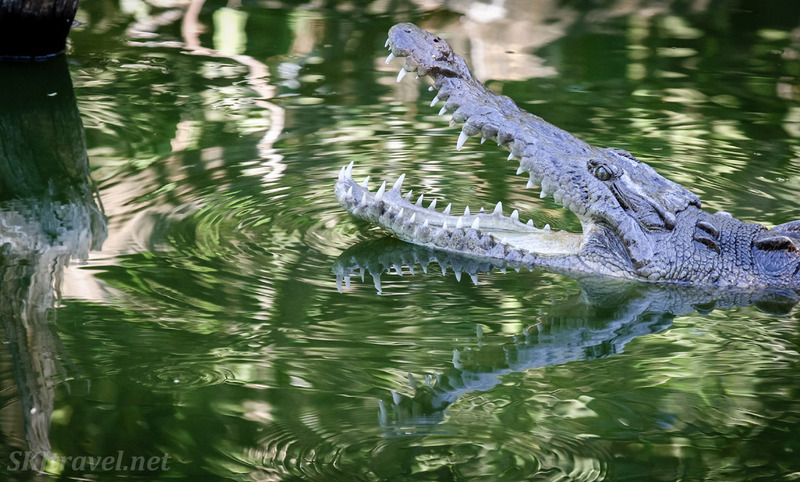 It's a reserve, vaguely fenced off from the public, designated originally for the protection of the American crocodile. 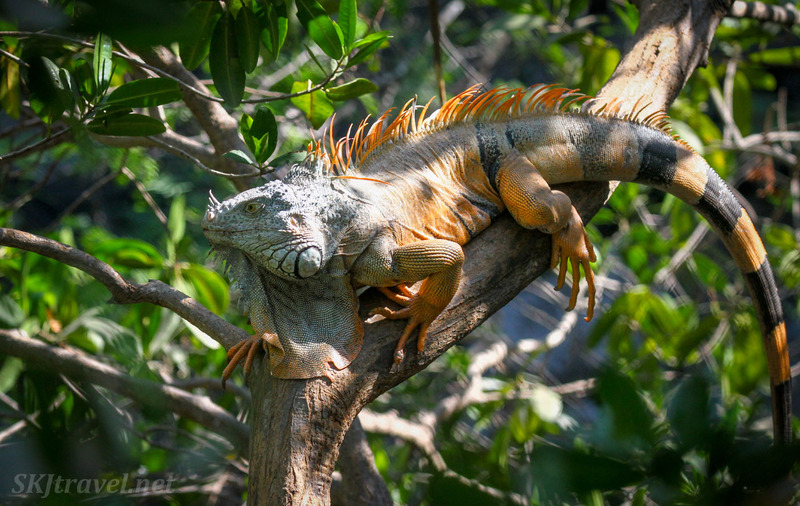 However, the lagoon ecosystem is also home to many beautiful species of birds, iguanas, turtles and other creatures. 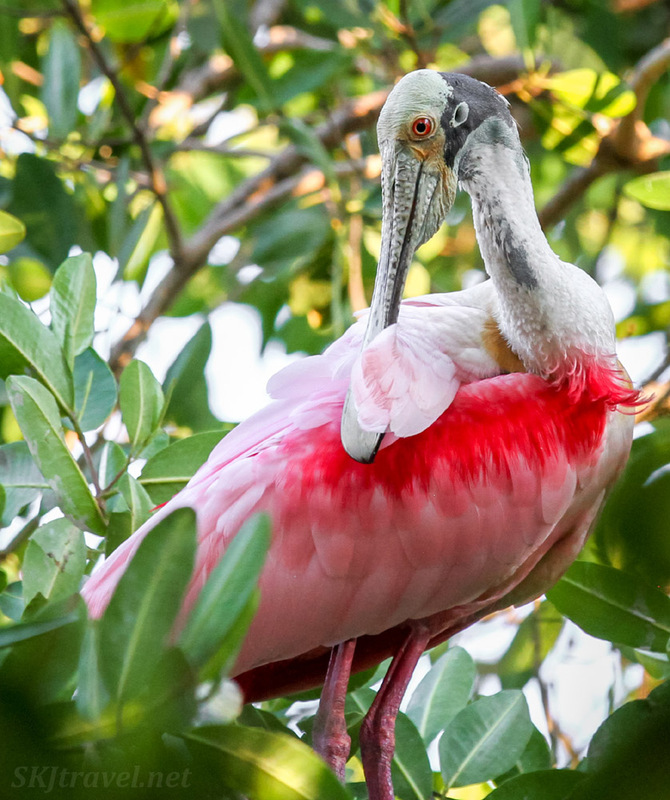 Since I started visiting there, I've watched the roseate spoonbill population explode. 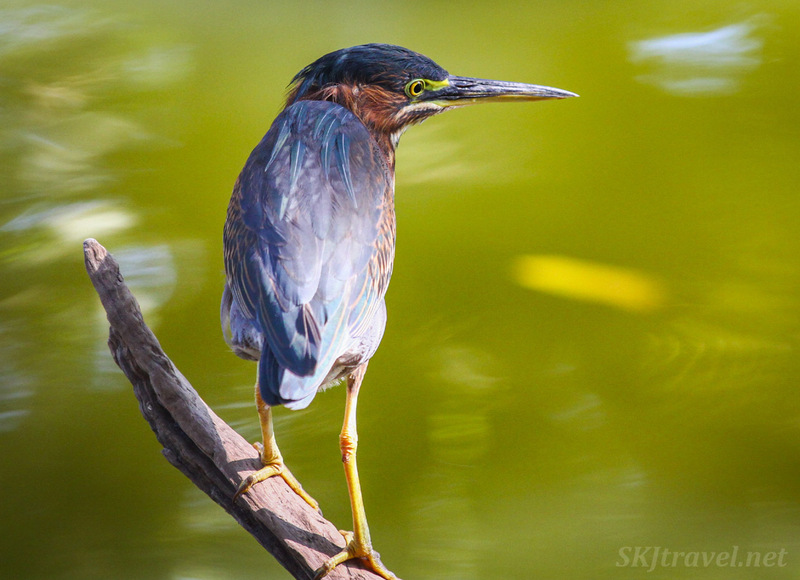 I've gotten more adept at spotting smaller birds such as the green heron, which has become a favorite of mine. And I've become fascinated by two types of lizards ... perhaps the most amazing thing of all since I am not a lizard kind of gal. Mostly I am repulsed by them. But these crocodiles and iguanas have opened my eyes and my heart to watching them more closely and appreciating them in their natural environment. So without further ado ... not much text to accompany this post, just enjoy my menagerie of lagoon creatures. Yes, it's MY menagerie! To see my encounters with them in years past, please see the Ixtapa archive HERE. It feels like my personal little lagoon, haha. Who to start with? Well why not start with my favorite photo between these two years. 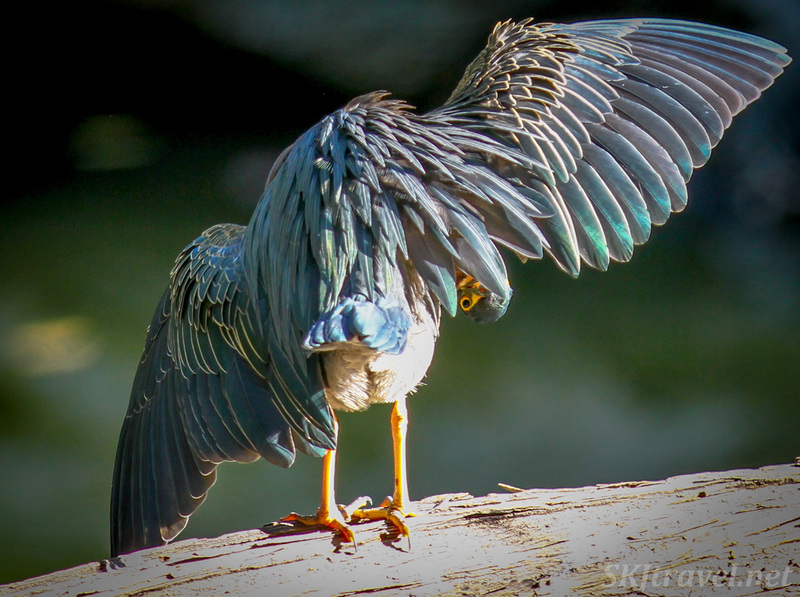 A green heron, the light shining on his opened wings to show their impressive iridescence. But I think its little head playing peek-a-boo from under its wing is cuter than all get-out. One of those wonderful surprises, I only saw this detail after getting home and looking at the pics on my large computer monitor. Yet another lesson in not deleting anything on your camera until you get home! One exciting thing about 2018 was that I saw a brand new species, the wood stork. 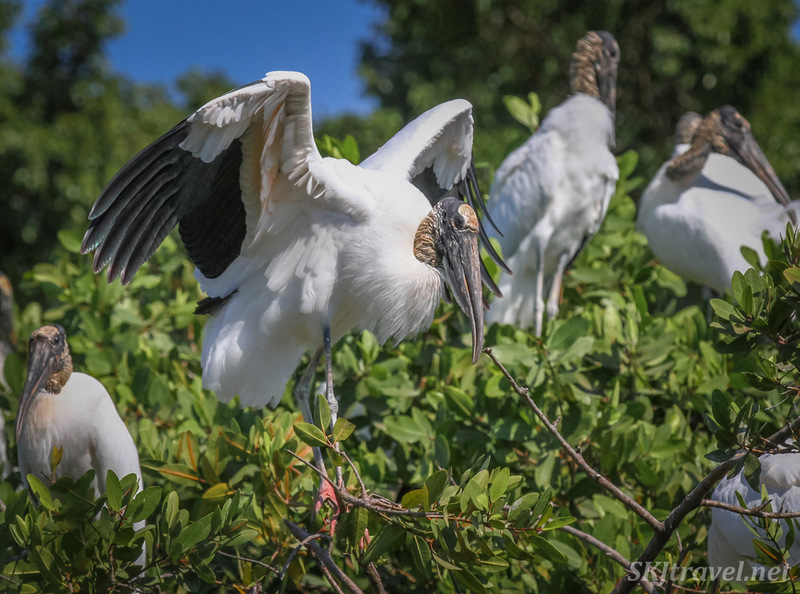 We visited a couple weeks earlier than we historically have, and caught the migration of wood storks passing through the area. As I've gotten pretty used to the same cast of characters, it was a really nice change. Whilst on the topic of new sights ... 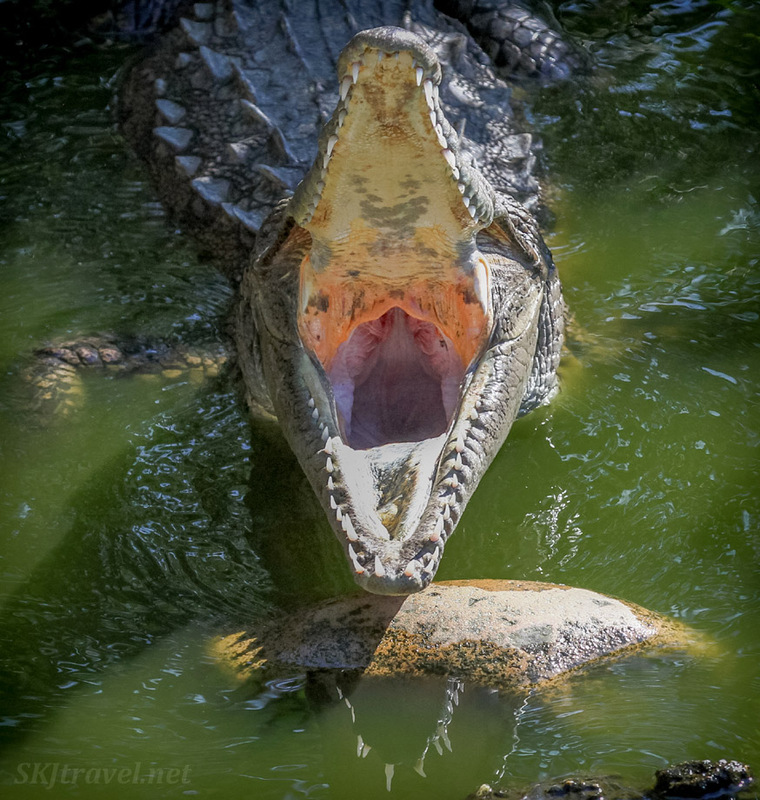 I've taken hundreds of photos of the crocodiles by now, but this is the first one showing a remarkable gradation of pastel colors inside the crocodile's mouth. And it's not just a one-off anomaly ... I took several shots of this open mouth, all came out the same. Who would have guessed the mouth of such a fearsome, vicious creature would be a sweet and gentle rainbow?! Now this guy, while not as large, is a better example of the terrifying perception we have of these ancient reptiles. 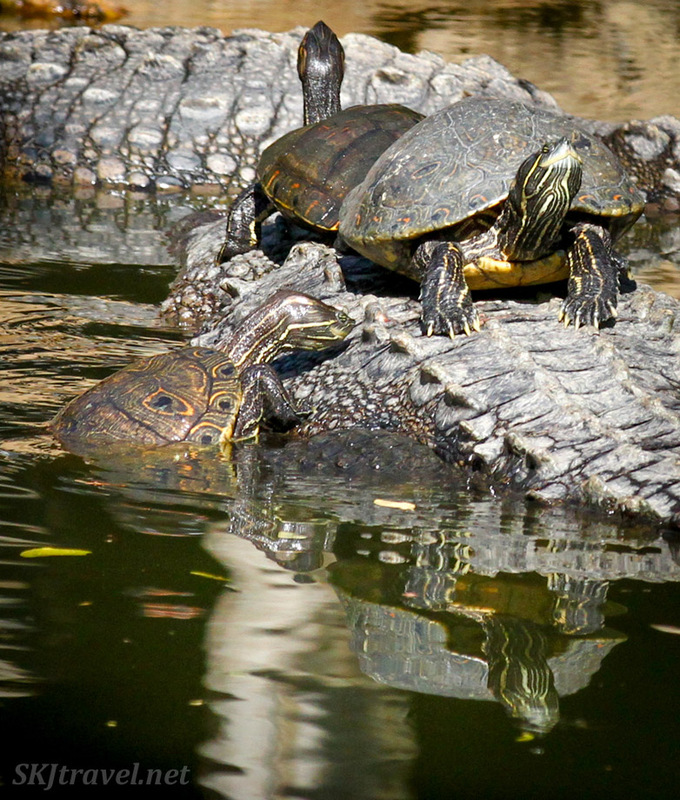 Although crocodiles are one of the few animals who can eat turtles because they're able to crunch through their hard shells, the turtles still like to use the crocodiles as water taxis and sunny resting spots. 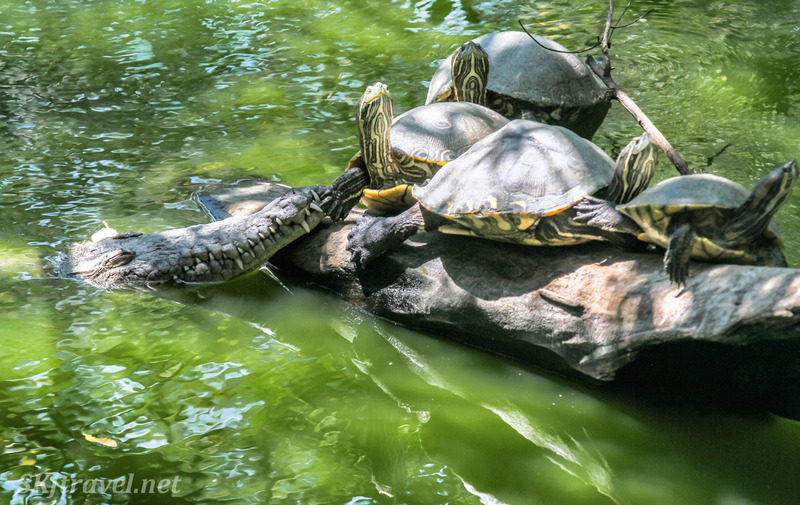 Hard to know if they're simply blasé about the danger or if the crocodiles are so adept at being incognito that the turtles are oblivious. 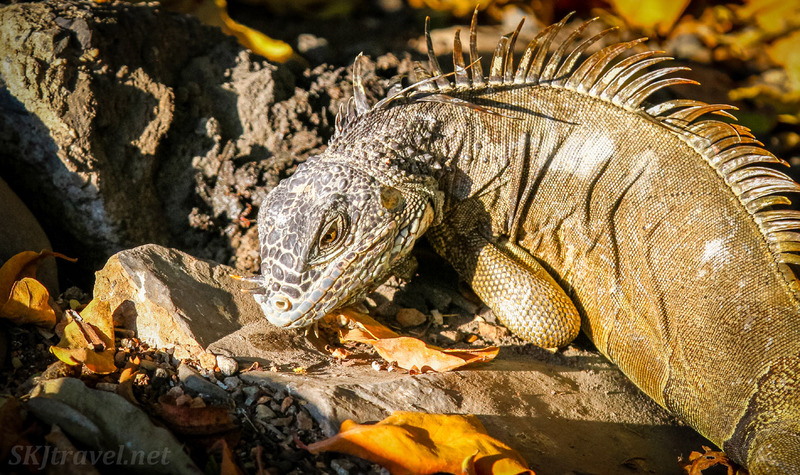 The iguanas continue to fascinate me. 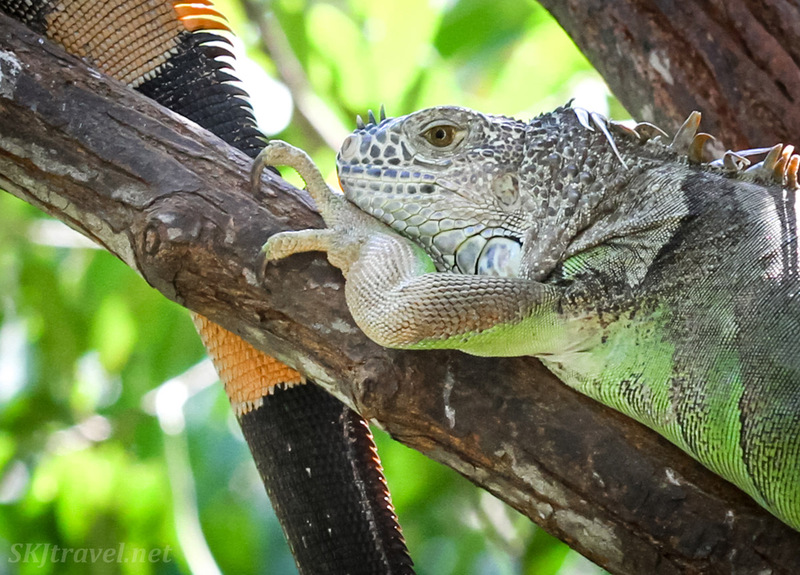 I also get a kick out of the other tourists around me who are visiting for the first time when they spot their first large male iguana. 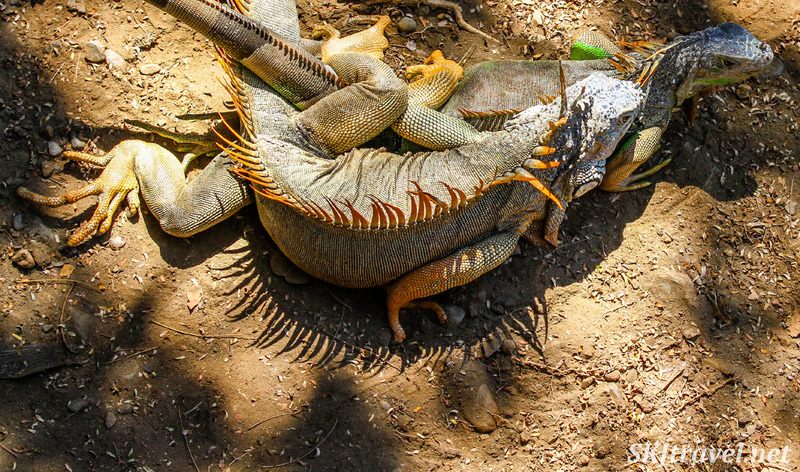 They get quite excited, and because I've taken so many pictures of iguanas already, I am often looking at something else. So a lot of them tap me and say, "Look, look, there's a big one right there!" as if I cannot see it. This guy looks so pensive, perhaps daydreaming of some pretty green female he's smitten over. 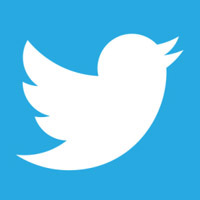 Here is a, umm, brown bird. 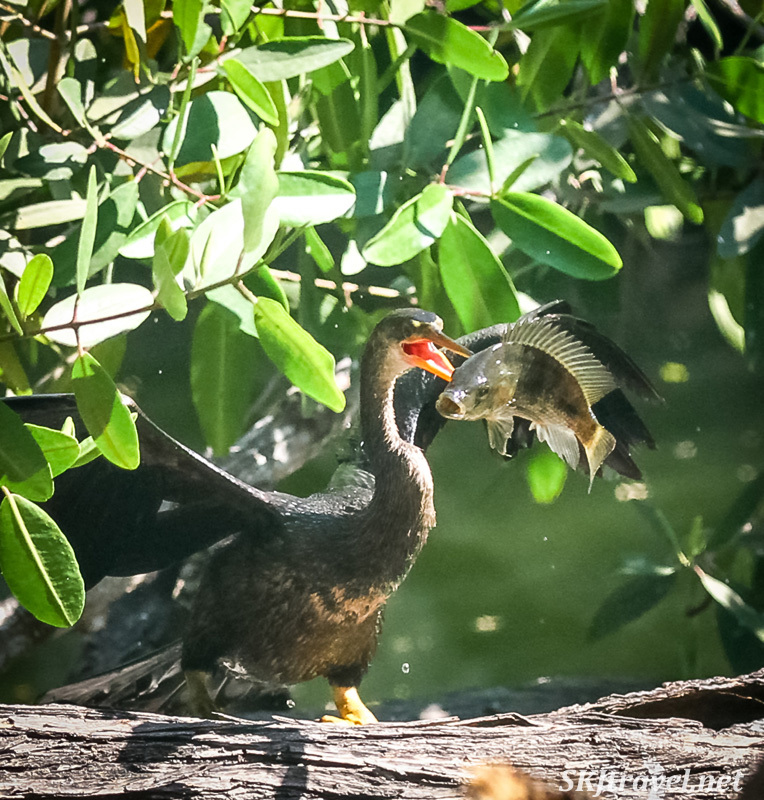 I was pretty happy to get a shot of it tossing a fish up in the air before gulping it down. 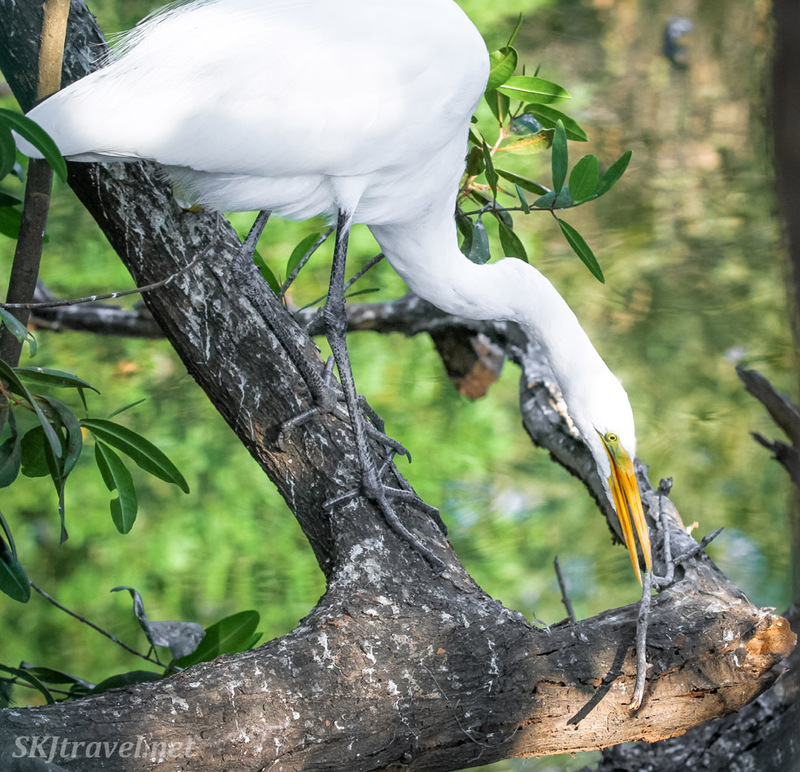 Even though they are common birds, I find the egrets to be elegant creatures with their pristine white feathers, and I enjoy watching them with their long toes and slender beaks. 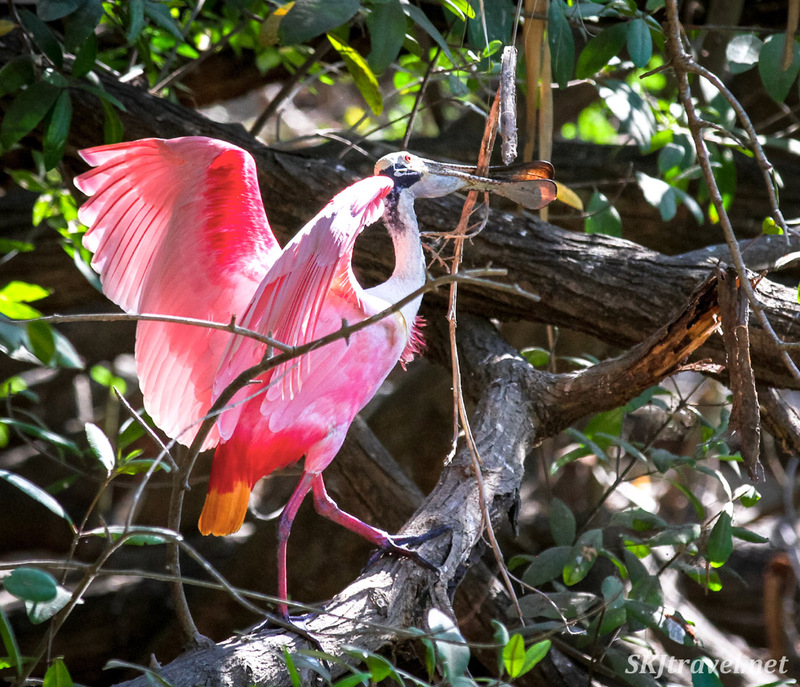 And last, but very far from least, a few photos of the roseate spoonbill birds. 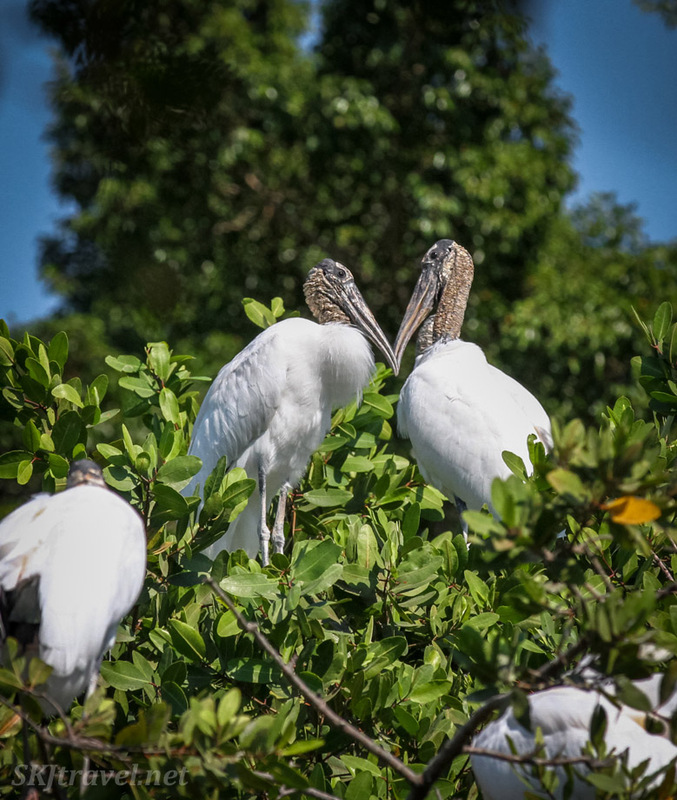 New visitors to the lagoon have the same response to the spoonbills as to the male iguanas, often poking me and pointing them out while I'm busy photographing something else. But it's OK; sometimes it's a tourist who has gotten me to swivel my head back to the birds out of politeness to their poking just in time to catch a new behavior. 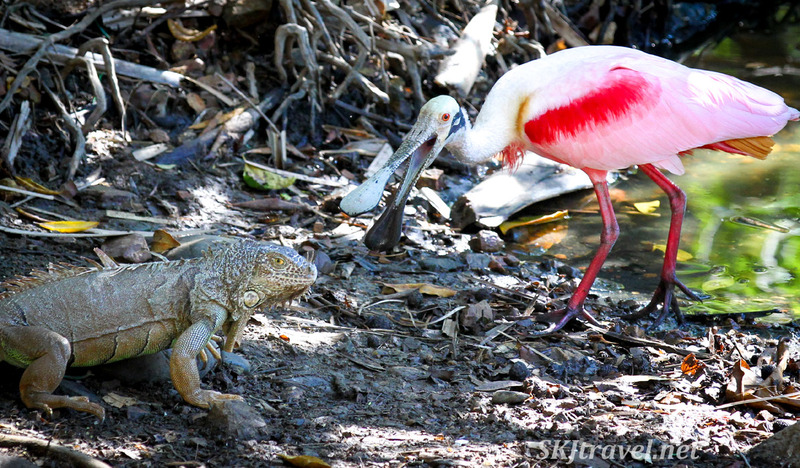 Like a spoonbill having a standoff with an iguana. 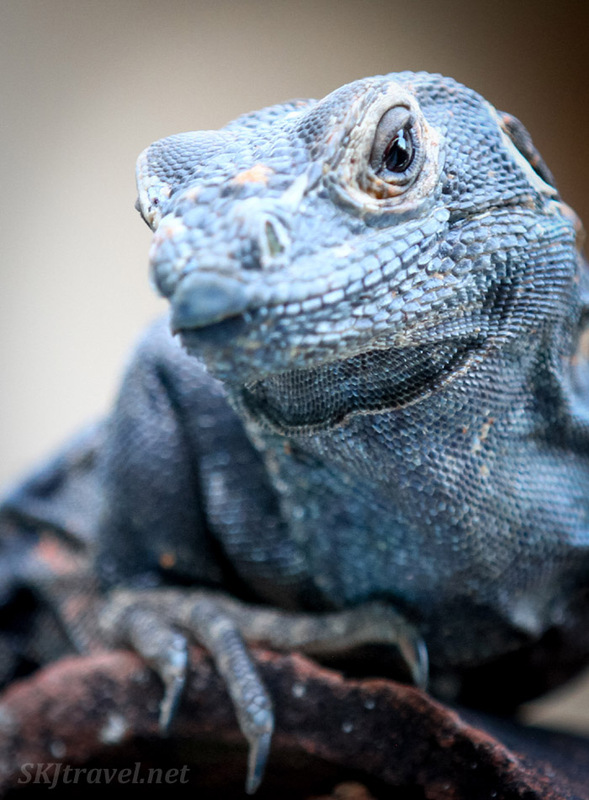 The look on the iguana's face cracks me up -- he looks like he's saying to me, "Do you see what I have to put up with?" 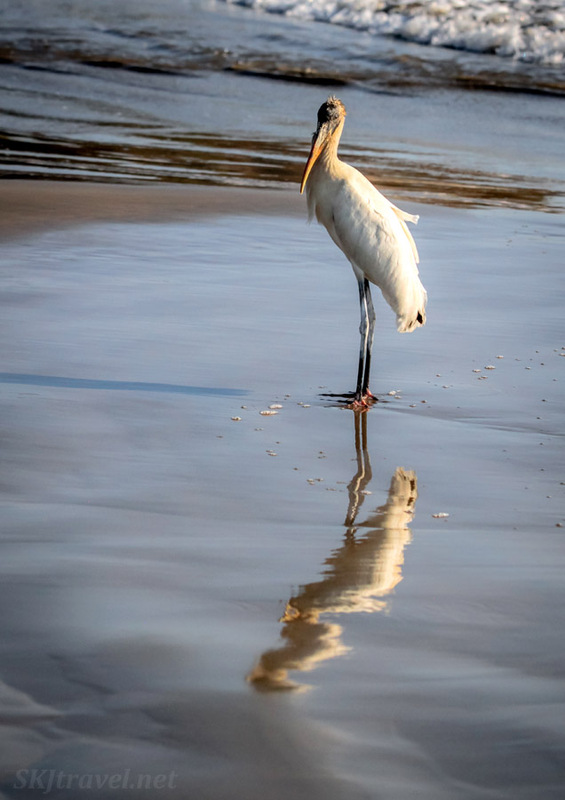 A spoonbill gathering sticks for its nest. 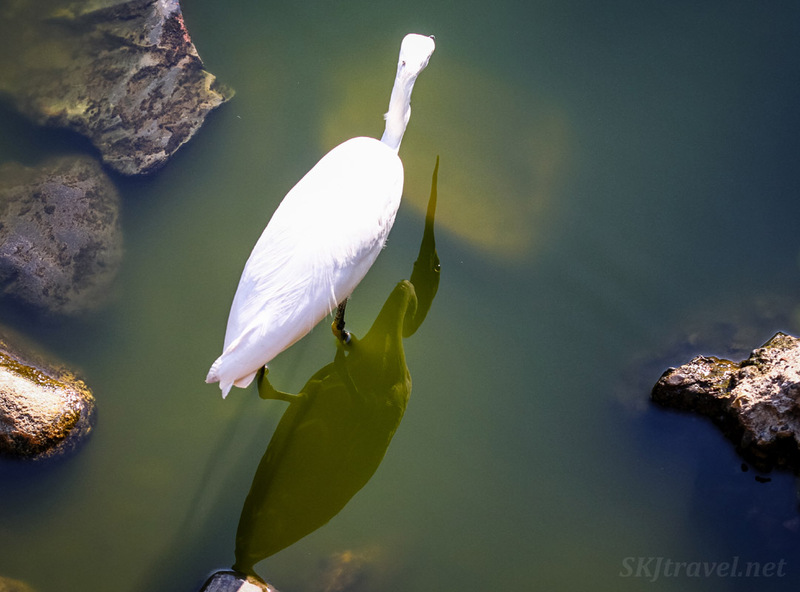 And a classic spoonbill pose, preening his feathers. Or her feathers ... unlike some birds, the males and females have the same coloring. Perhaps, dear reader, you are beginning to feel like this little lagoon belongs to you, too, by now! Hope you enjoyed another round of photos with these beautiful creatures.